The kitchen island is a great example of a kitchen feature that can combine both form and function. A kitchen island is basically an unattached counter, usually situated in the middle of the kitchen area which allows access from all four sides. Kitchen islands can serve as the center for both cooking & food preparation activity, as well as a place for eat-in dining. This page features our gallery of kitchen island ideas for inspiration. The most common type of kitchen island shape is rectangular but you don’t have to stick to that and can have one in a shape or form that best suits your kitchen space or style. Rounded, L-shaped and T-shaped islands are common alternatives to rectangles. You can also consider freestanding islands, which are basically tables or carts. This option is good for small kitchens as they keep things from feeling cramped. While the basic function of a kitchen island is to provide you with extra work space by increasing the countertop area of your kitchen, depending on its other features there is a type to suit everyone’s needs. Many types blend countertops with cabinetry at the base. The base can have drawers, open shelves, bookshelves and cabinets to provide you with extra storage space and even serve as display space. Some types serve as specific work areas or points in the kitchen work triangle. These types can incorporate practical kitchen details such as secondary sinks, appliance nooks or even stove cooktops to help you make the most of your space. 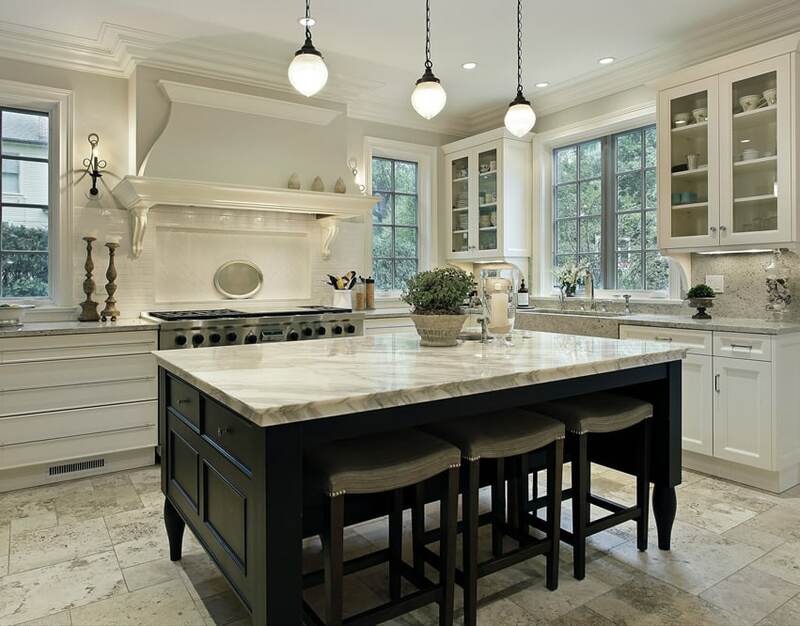 Kitchen island designs that are cooking centric incorporate a cooktop or range into the island. This style can focus on meal prep and have a large, uninterrupted surface space. Some types can also incorporate a sink or a dishwasher to help with post meal clean up. The island is placed at the center of the room so it can serve as the center point of cooking preparation, but it can also serve as the center point of entertaining and socialization. An island can take the place of a kitchen table and can have seating incorporated to allow it to serve as an informal dining area and activity hub. A great island can actually have two-tiers or spaces, one work area and another as an entertaining area. The work area should provide enough space so more than one person can join in and help in meal preparation. Meanwhile the entertaining area should provide comfortable seating for people to talk and hang out in and interact with the cooks and after the meal is ready, a place to enjoy eating it. Whatever shape or style you choose for your kitchen island make sure to take into consideration the amount of room it will take up. Remember you will have to be able to maneuver around the island and from there have easy access to the rest of the kitchen. The size, form and placement of a kitchen island should never block the flow of kitchen traffic. The picture above showcases a contemporary kitchen with classical inspiration which uses a neutral color scheme. It has white kitchen cabinets with simple panelings and a gray salt and pepper granite countertop. It also has a large rectangular kitchen island in the middle, in a dark gray finish and topped with a thick slab of Calacatta marble. The kitchen island has a space where you can stack three bar stools inside, in case you don’t intend to use them yet. The space is well lit with a variety of windows as well as hanging pendant lights above the island. Custom kitchen islands are a great way to maximize your kitchen’s efficiency and storage needs while helping you achieve the exact style you want. 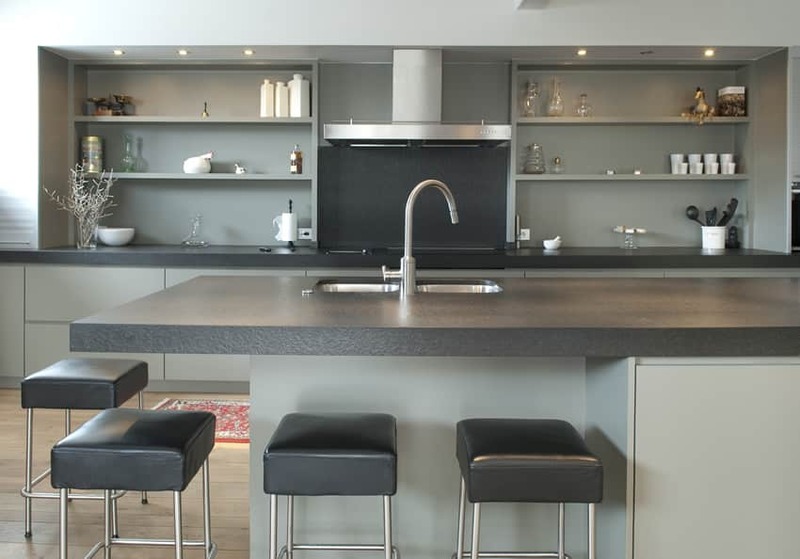 The kitchen design in the image above demonstrates a coordinated balance of warm and cool gray tones. While walls are finished with a warm gray/brown tone, the cabinets keeps itself in neutral white with a warm gray solid surface countertop which matches the walls. Stashed underneath the island counter, you will notice three bar stools with cool gray upholstery, helping balance out the warm tones of the kitchen. One of the easiest ways to get a custom kitchen island on a budget is to be creative with the material you use for the countertop. 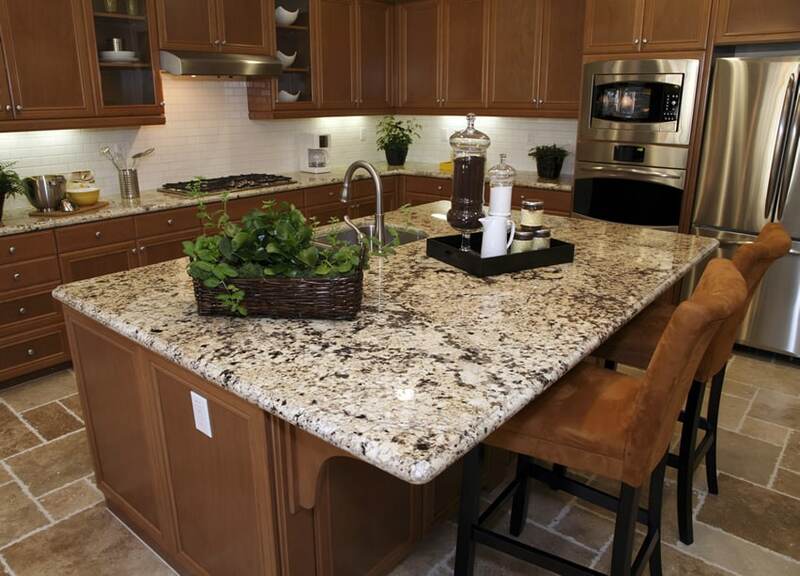 Granite countertops are a stylish, durable and classic choice but then can be a little pricy. 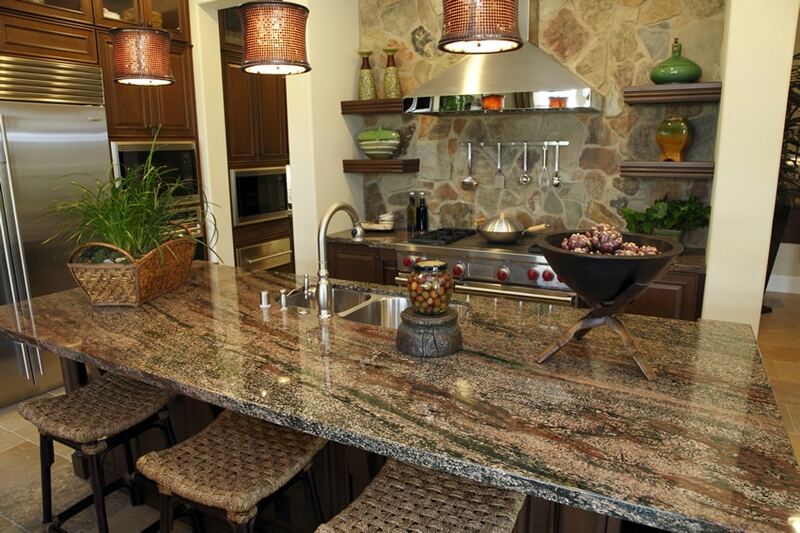 According to Consumer Reports, the price of granite ranges from $20-60 per square foot. 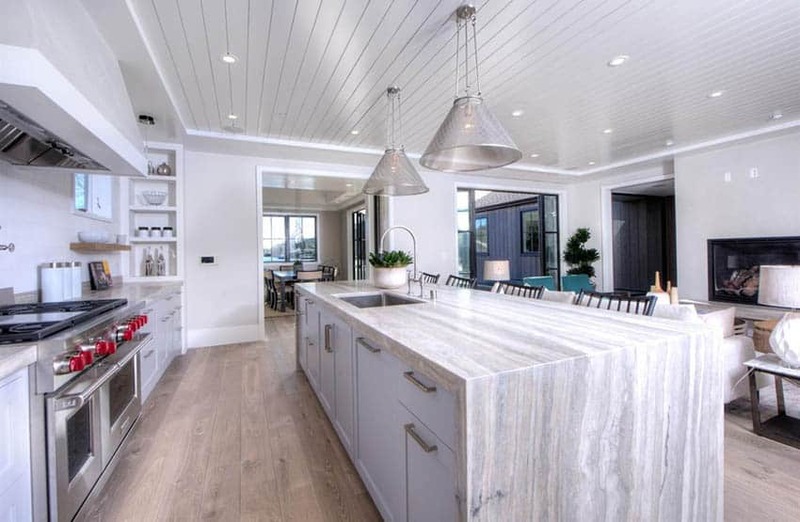 Marble is also another popular material and its glossy surface is often associated with luxury kitchens – unfortunately, it also has the luxury price to match, usually going for $25-100 per square foot. 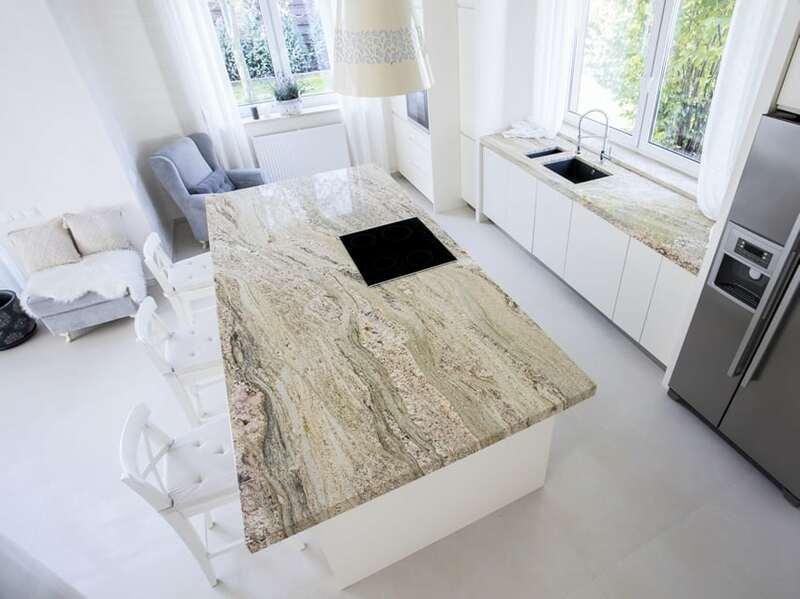 If you want the classic and classy look of granite, marble, and other natural stone countertops but are not so sure about shelling out that amount of money, a good alternative would be to put in quartz countertops. Quartz, otherwise known as engineered stone, is made from a mix of stone chips, resins and pigments. You can get quartz countertops for around $20-60 per square foot. 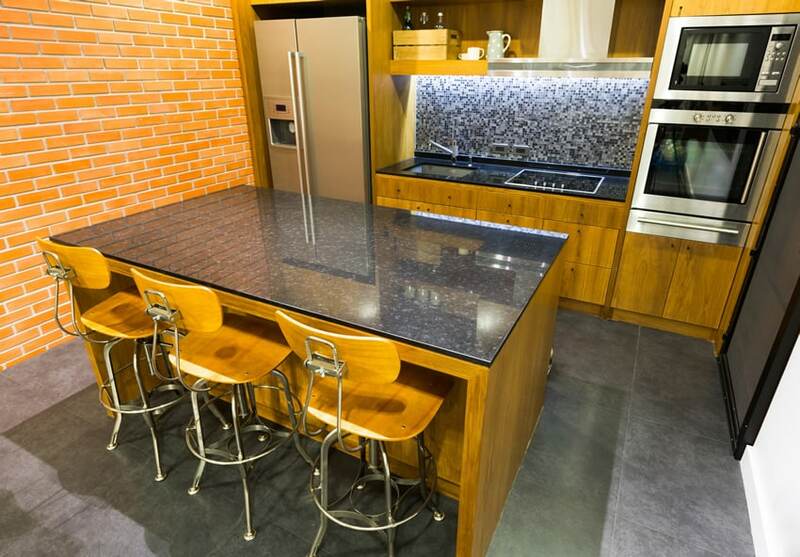 These durable countertops come in a variety of colors and can convincingly mimic natural stone. One of the most budget friendly materials you can use to get the custom made countertop that you want is laminate. To get a laminate countertop, you’re going to have to shell out only around $5-25 per square foot. It’s easy to be creative with laminate as this material is available in a wide array of colors and patterns. 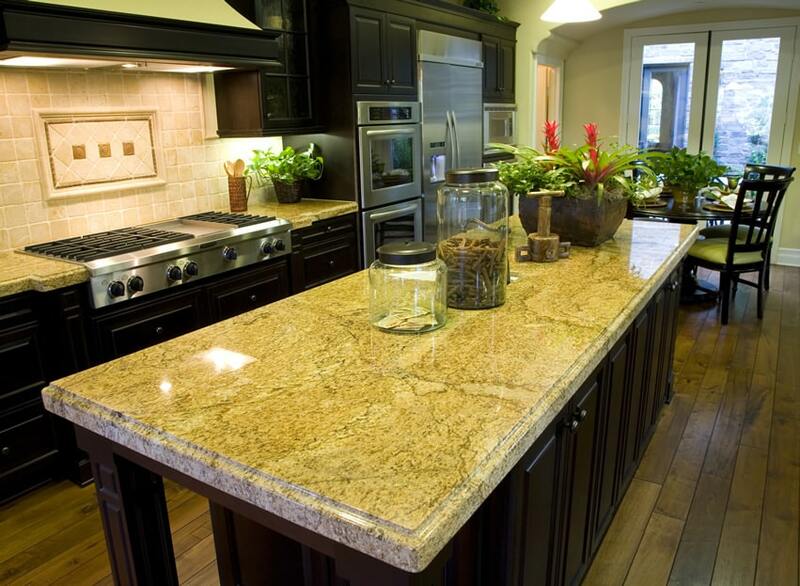 You can even get some that resemble the more expensive materials such as granite or marble. Perhaps the most budget-friendly and easily customizable countertop material option available is tiles. To use tiles on your countertop, you should budget around $5 to 15 per square foot of countertop. Countertop tiles can be ceramic, porcelain, or stone and are durable and easy to clean and maintain. They are also beautiful and are available in a wide variety of colors, sizes, and pattern – very customizable. Tiles allow you to get truly creative and create a unique look for your countertop. You can play around with the types of tiles you use, blending different colors and mixing different patterns to create a design that suits your tastes. You can even create a mosaic to truly ensure that you have a unique, one-of-a-kind custom countertop. Wooden or artificial wood butcher block countertops are also relatively cheap at $30 per square foot. 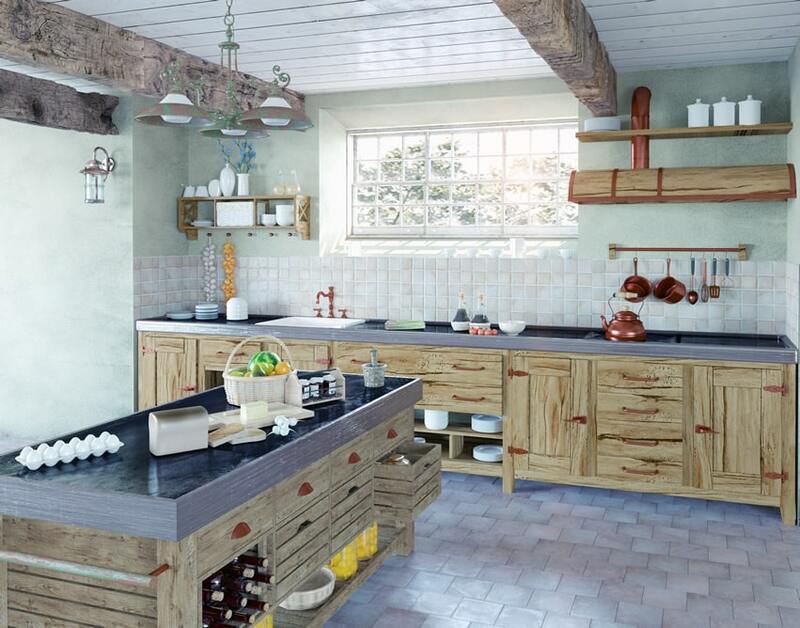 These wooden countertops work very well if you’re looking for a country or rustic looking kitchen. They also help add some homey warmth to an otherwise “cold” kitchen. This kitchen features a beautiful natural wood countertop island with rich navy blue cabinetry and brushed brass drum pendant lighting. 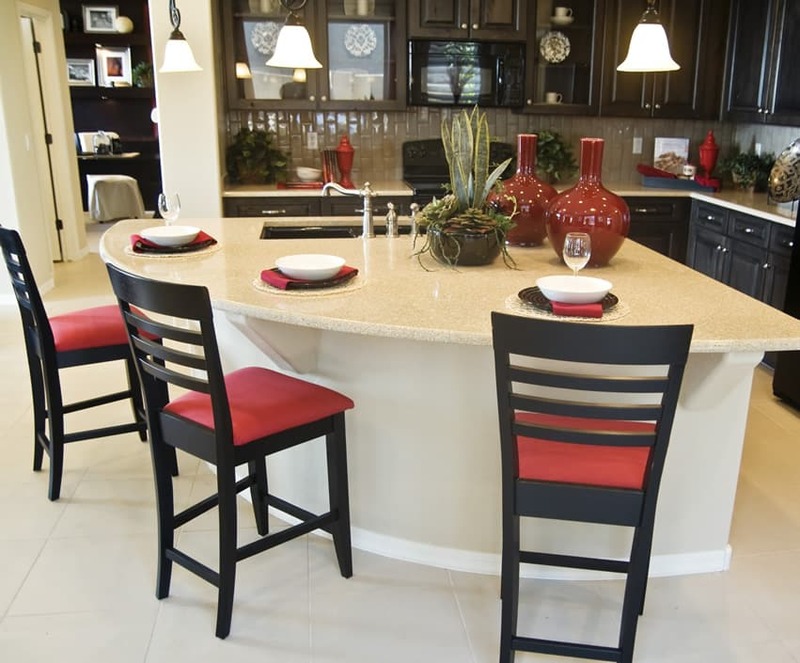 This quarter circle island counter is an ideal addition to the kitchen space. Made from built-up gypsum board with a white granite countertop, this area serves as the wash area, an additional preparation surface and a small dining/breakfast area as well. The layout of a kitchen island with sink can be a big help with food preparation and clean up. The dark wengue stained barstools contrasts well with the white counters and the red upholstery matches the red accent pieces found on the rest of the kitchen. A fairly large kitchen directly adjacent to the dining room which has a large kitchen island counter. It has two levels. The lower, standard counter-height part of the island has the under mount kitchen sink and the built-in dishwasher, while the larger and higher part of the island counter serves as additional preparation area and additional dining/breakfast space. 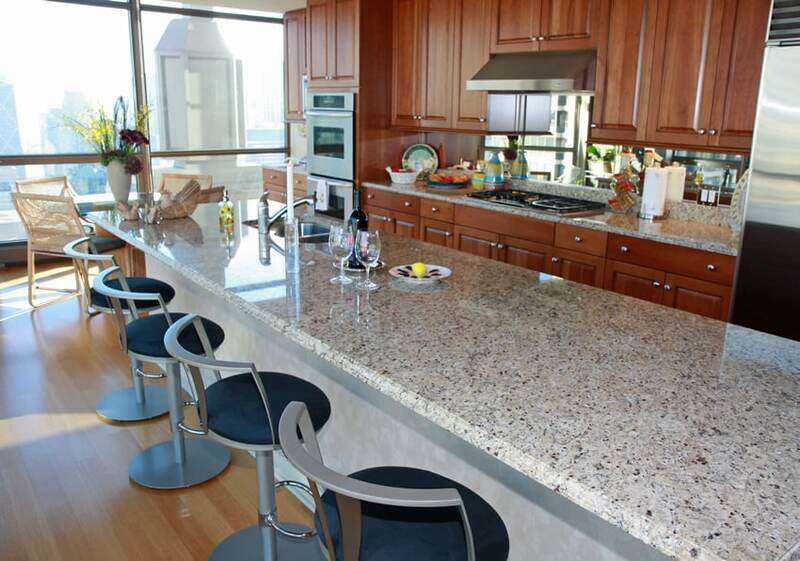 The whole kitchen uniformly uses a gorgeous Himalayan white granite countertop. This large custom kitchen island demonstrates a two level design with a breakfast bar counter on one end, and a food preparation area on the other side. 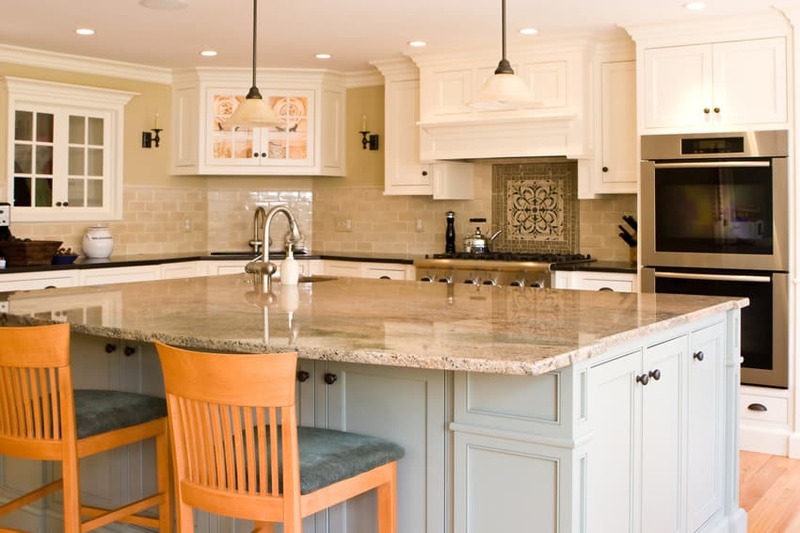 Remember that your kitchen island is first and foremost your main working area. As such, a kitchen island countertop can incorporate a sink area or even an oven. The base of a kitchen island can also have a number of unique and functional element such as drawers, cabinets and other storage space. Incorporating built-in cabinets into the base of your kitchen island is another great way to customize your work area. Another advantage to having cabinets in your island’s base is that you have storage space easily in hand. This makes food preparation easier and can help you maximize your available kitchen space. There are three basic cabinet types. These are stock, semi-custom, and custom. Make sure that you pick a cabinet type that matches your taste and your overall kitchen design. Stock cabinets are also known as budget cabinets, and, as the name implies are the most budget-friendly cabinet option. You can get a stock cabinet for as little as $70 per foot. A stock cabinet can be bought pre-assembled or assembles from home centers. While stock cabinets can be the most convenient choice, they do tend to be limited in terms of style or colors available. Semi-custom cabinets offer a bit more variety and – if you can’t find a stock cabinet that fits your vision for your dream kitchen design, is the second most budget friendly type of basic cabinet. The price range for a semi-custom cabinet starts at $150 per foot. A basic semi-custom cabinet will use face-frame construction where the wood frames can be seen around the doors. Semi-custom cabinets also usually have custom options, allowing you to choose a size and material. They often also provide options as to types of finish and trim. 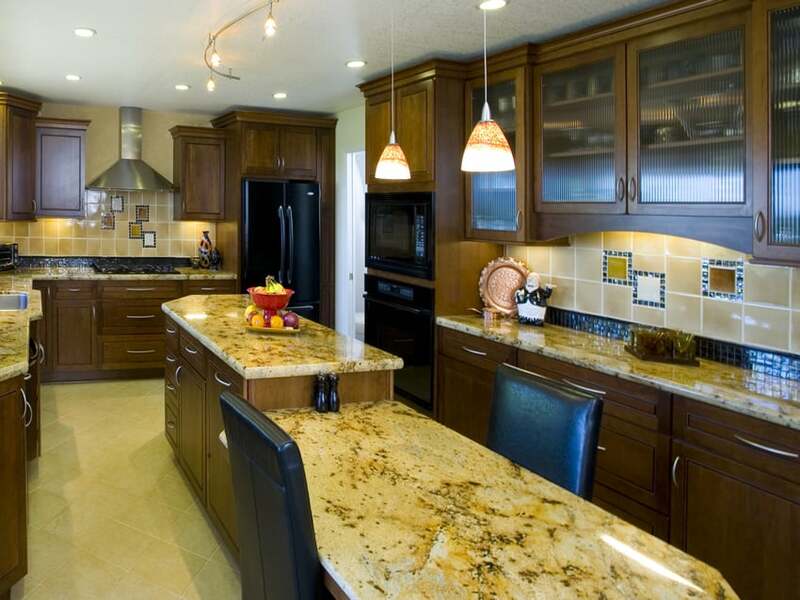 Custom cabinets are cabinets that are made from your exact specifications. While this means that you will be getting a cabinet that totally matches your vision for your dream kitchen, this also means you’re getting a cabinet that is pricier then the first two cabinets we mentioned. The cost for this type of cabinet starts at around $500 per foot. You can also customize the cabinet bases of your kitchen island through your choice of cabinet door. Make sure that you choose a cabinet door style that matches your design and theme. Flat panel cabinet doors are doors where the center panel is flat. These doors are very sleek and clean looking and go well with minimalistic, modern styles. Raised panel cabinet doors are doors where the center panel is raised and surrounded by a contoured frame. These cabinet doors are usually favored by those who like a traditional look to their kitchen. Slab cabinet doors are doors which come as a solid piece, with no frames or panels. These minimalistic doors are usually used in contemporary kitchen designs. A Mullion cabinet door is a cabinet door that is made up of glass panes. The frame of the door is made of wood or aluminum and strips of this material create a grid over the glass panes. There are a lot of pretty designs that you can get with this type of cabinet door. 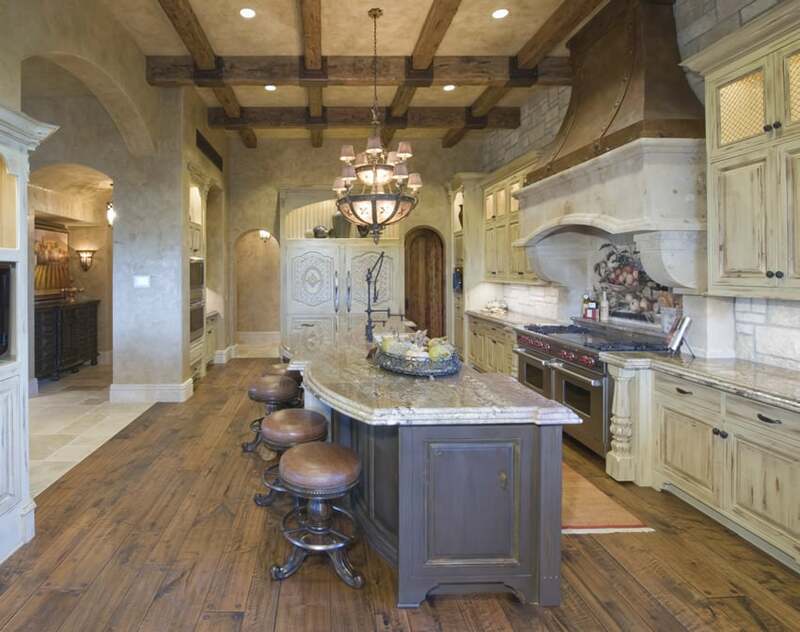 A large traditional kitchen with a large wengue-stained multi-level kitchen island. The standard counter height surface serves as additional preparation area for the kitchen, while the narrow bar-counter height surface is for dining. 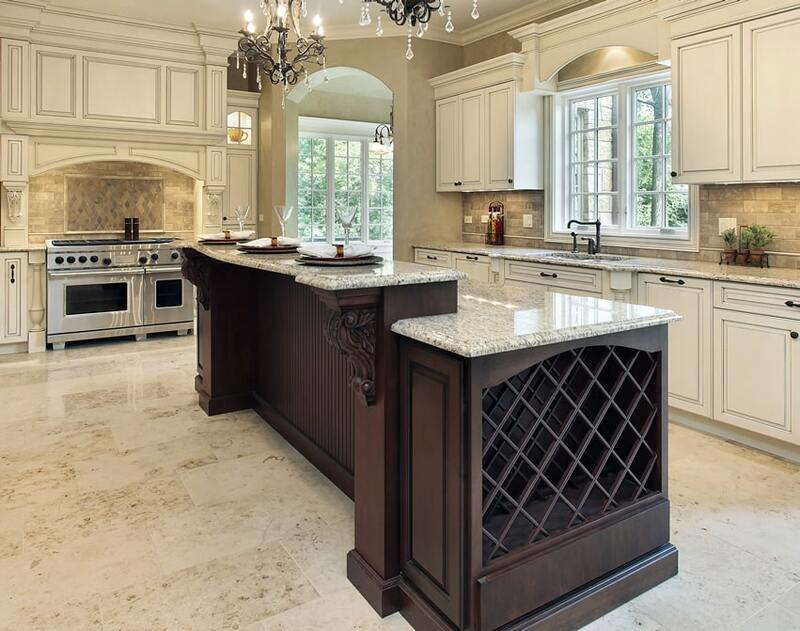 The kitchen island also integrates display and storage for wines on its sides and uses salt and pepper granite for its countertop. This kitchen uses a lovely shade of emerald green for its kitchen cabinets, instead of opting for the more common wood finishes or neutral colors. 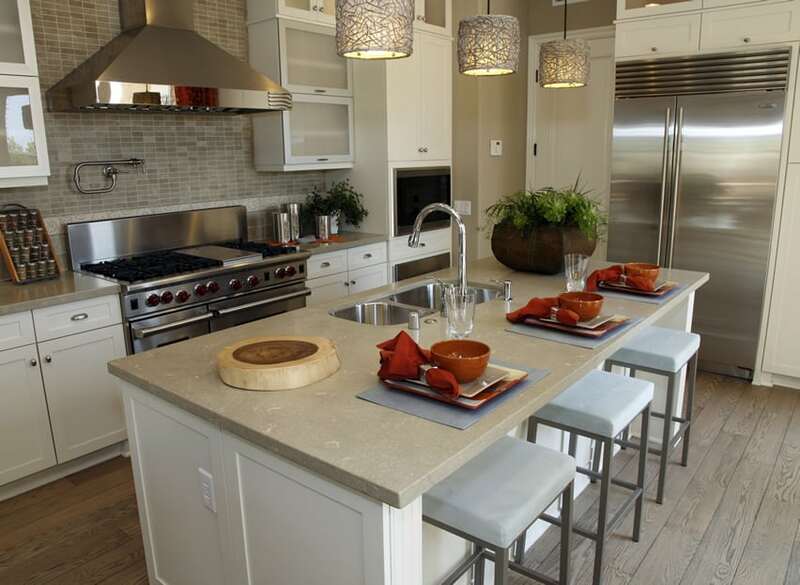 It has a large kitchen island of the same finish, with an integrated cooktop and a beautiful slab of gray soapstone. A kitchen island with stove is great for entertaining guests and really helps the cook enjoy socializing during meal prep. The teak wood finishes used in these kitchen cabinets is consistent with the interior finishes, like the door frames and baseboards. 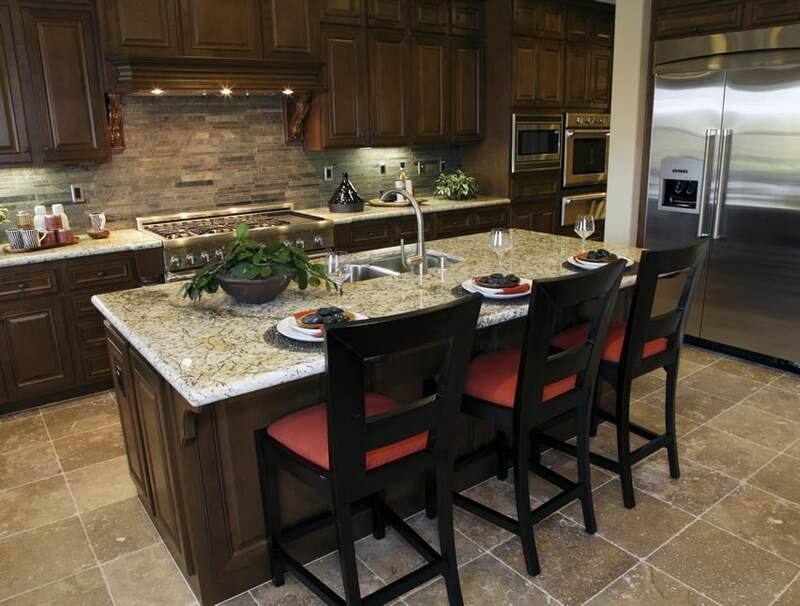 The L-shape kitchen has a long kitchen island with a sienna granite countertop. Integrated into the kitchen island is a stainless steel sink and a small surface can accommodate two diners. 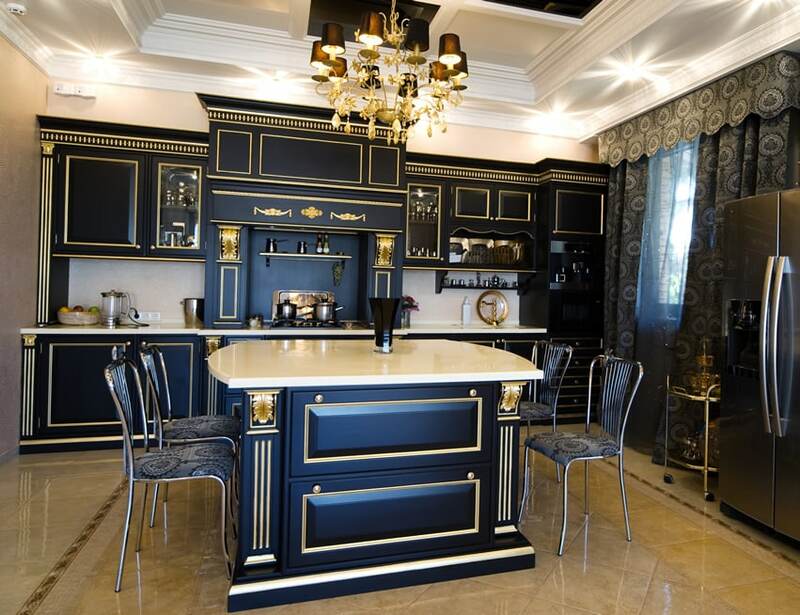 This unique empire-style kitchen uses cabinets painted in black, and has molding details painted with gold. It’s uniquely-shaped kitchen island uses the same finish as the main cabinets and uses cream-colored granite countertop to go with it. 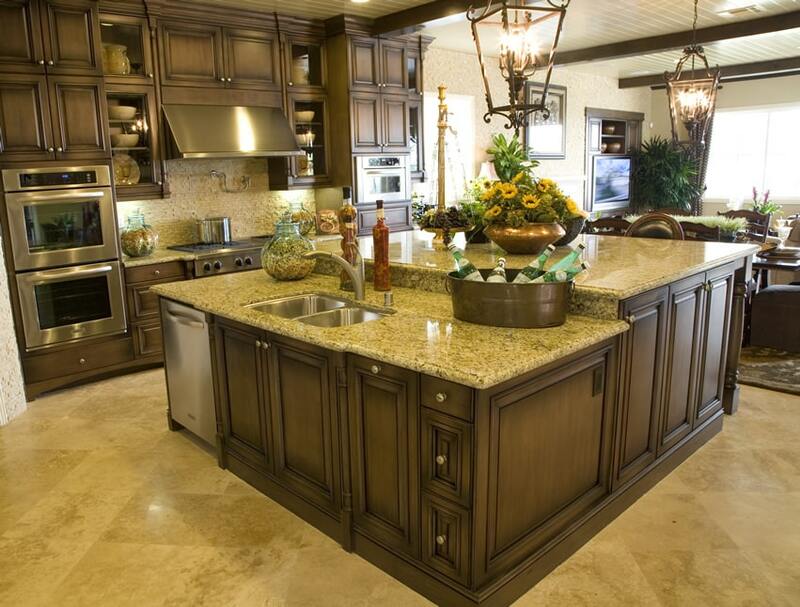 This island is mostly used for additional dining space, storage and preparation area. 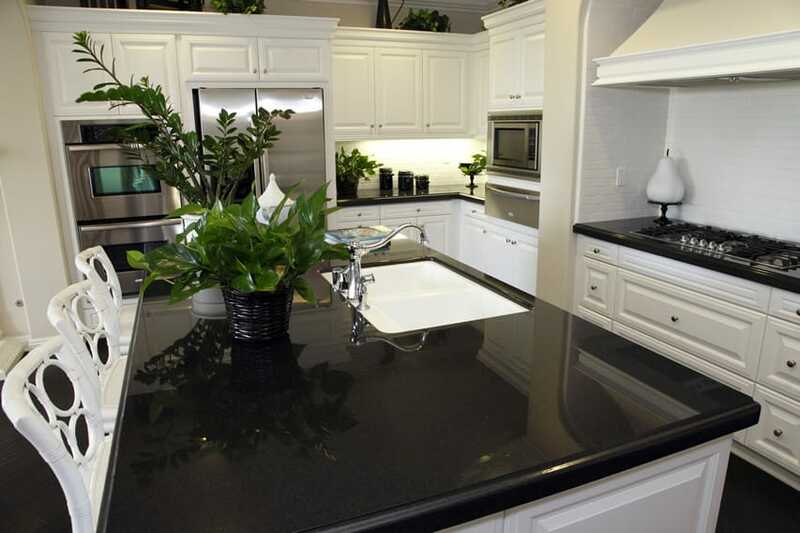 Another traditional-style kitchen which uses off-white painted cabinets and a slab of black granite countertop. 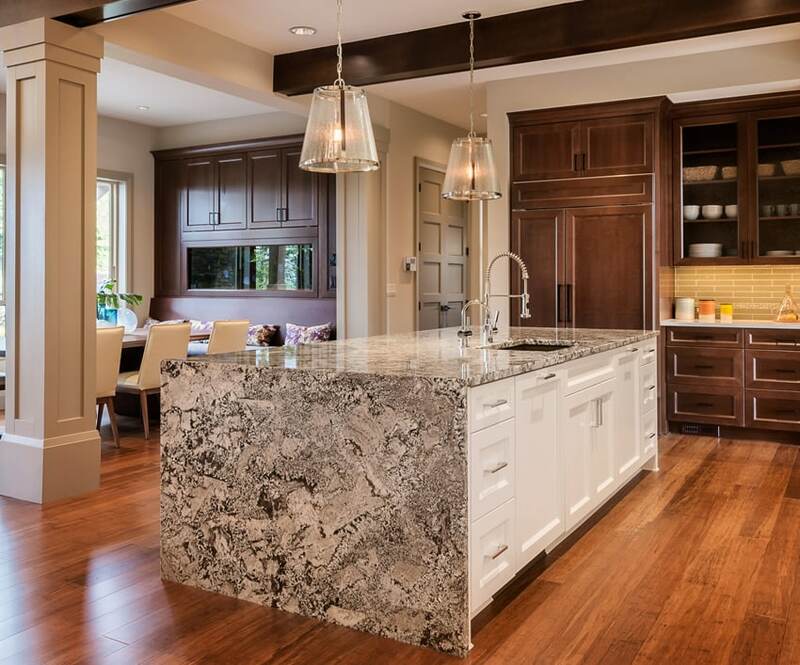 The kitchen island in this design uses the same finishes as the main cabinets, but uses a thick slab of gray granite for its countertop with intricate nosing detail. 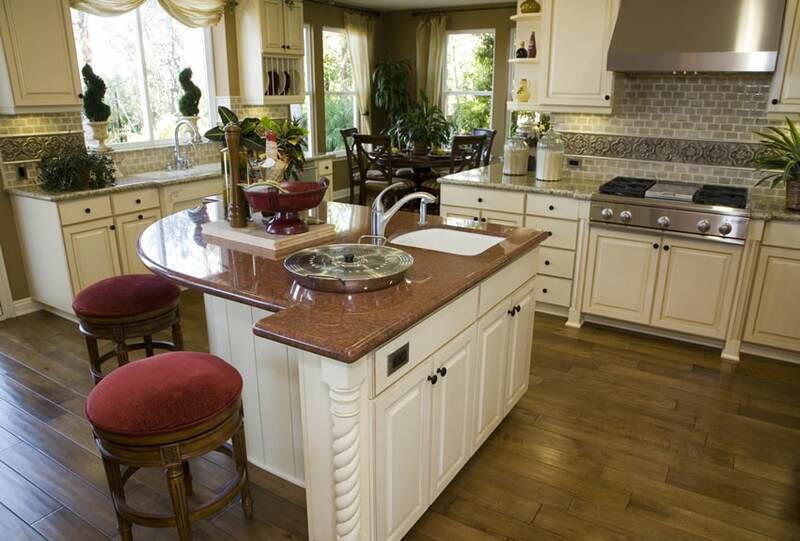 A classic kitchen design which also integrates a kitchen island counter in the center. Unlike most kitchen islands which follows a curved, rectangular or l-shape form, this one has a more irregular shape reminiscent of the shapes of classic moldings. 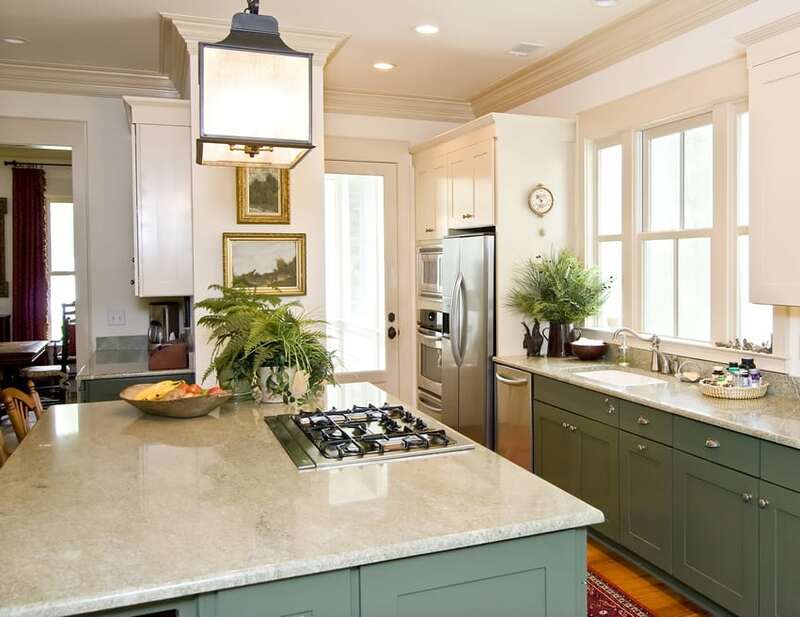 The light pine cabinets give the space a softer look and matches well with the Himalayan white granite counters. 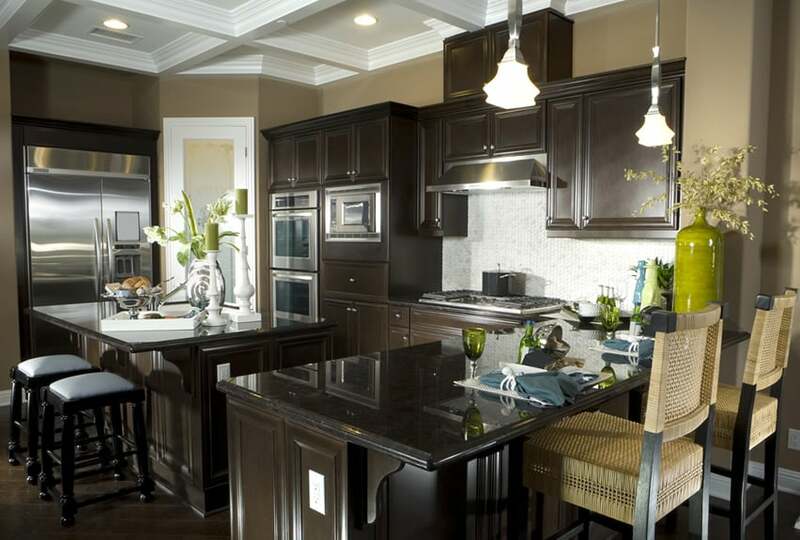 A dark-themed kitchen which combines dark finishes – dark wengue for the cabinets and black granite for the countertop. It has two kitchen islands, one of which is at standard counter height, and another at bar height. 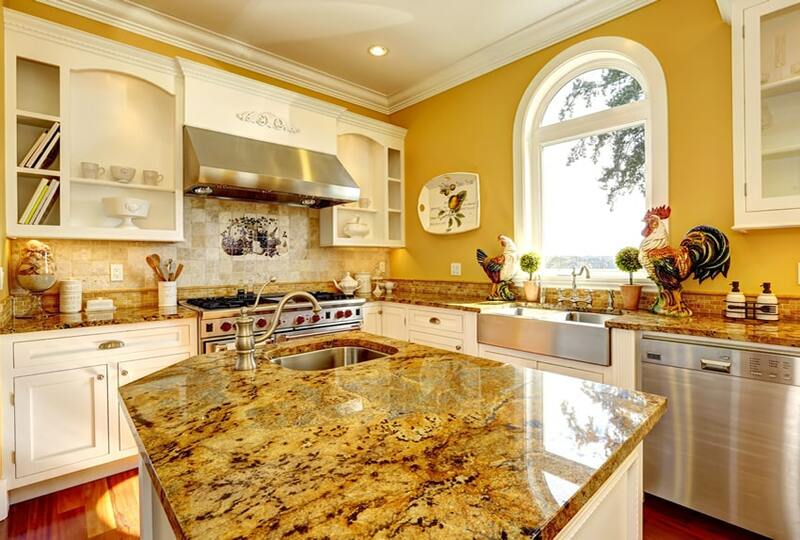 Matching the yellow theme of the room, the kitchen counters uses a yellow stone countertop material instead of the more common neutral choices. 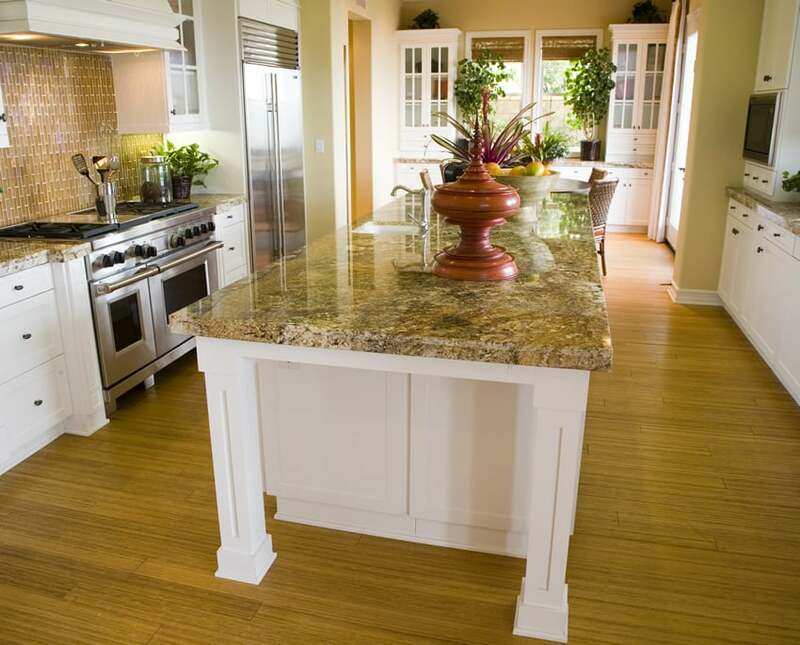 The yellow gold color and natural veins of the kitchen island granite counter blends well with the yellow walls and white cabinets and serves as a great additional counter space for washing the dishes and preparing food. 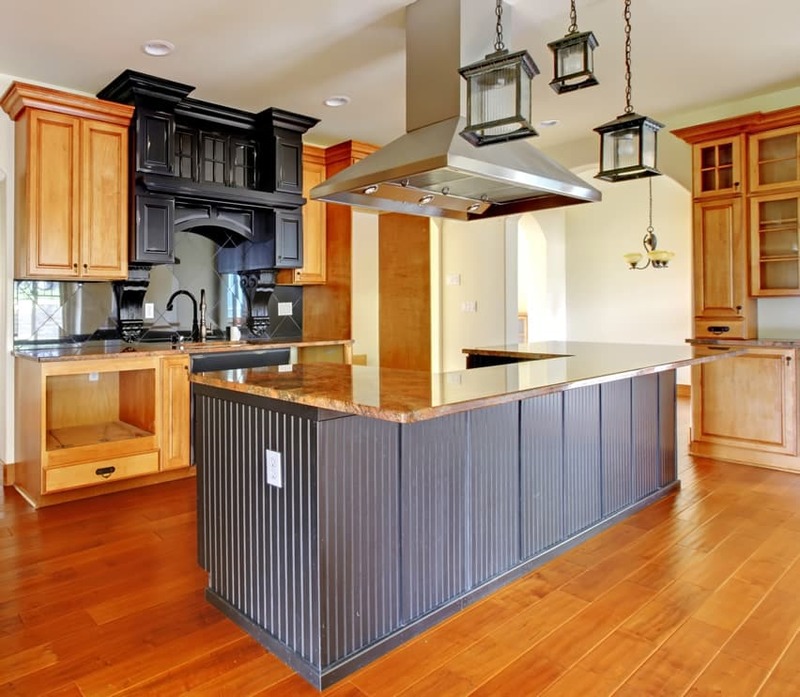 This kitchen island functions more as part of the kitchen than as additional bar/dining area. Built with solid Oak wood cabinets and beige granite countertop, it also has a built-in undermount sink and built-in dishwasher. The bar counter is separated from the kitchen island. A black and white kitchen design space which uses mostly white cabinetry to create a bright-looking kitchen space. The L-shape kitchen includes a large rectangular kitchen island with the same white cabinetry and black granite countertop. Adding a kitchen island is an ideal way to create more counter space, display and storage to the kitchen. Here are some different island plans to help you find the design that is perfect for you and your families needs. This kitchen follows the classic kitchen cabinet design plan but has a more modern choice of color palette, mainly using white for its counters and a simple salt and pepper granite countertop. The sizable kitchen island counter is square in shape and is placed in the middle of the kitchen, making it an ideal preparation surface coupled with a built-in wash area. Underneath the cabinet of the island one can find built-in wine storage and plenty of drawers and cupboards for storing utensils, pots and pans. The island features a two level design with a step up to a breakfast bar to provide more room from dining and entertaining. A kitchen which uses a long island with light colors and finishes to create a bright-looking kitchen space. The warm color of its laminate floors adds a warm glow to the white-painted cabinetry, while the thick slab of sienna beige granite blends well with the flooring material. The kitchen island in the center also has the same white cabinets and countertop material, and only serves as additional prep area devoid of sinks or cook tops. A showcase kitchen which effectively highlights the beauty of the kitchen to the dining area adjacent and the rest of the house. It has mahogany-stained main kitchen cabinets and a large kitchen island with white cabinets & drawers and gorgeous black and white granite countertop which goes up to the sides of the kitchen island. A traditional-style inspired kitchen design, this large kitchen island modernizes the neoclassic details by removing other carving details. It is finished with dark gray paint and has a gray soapstone countertop and an integrated ceramic sink. A straightforward kitchen island, almost cubic in form. The island adapts to the u-shaped design and matches the kitchen counters with pine wood for the cabinetry and Bianca Sardo granite top. 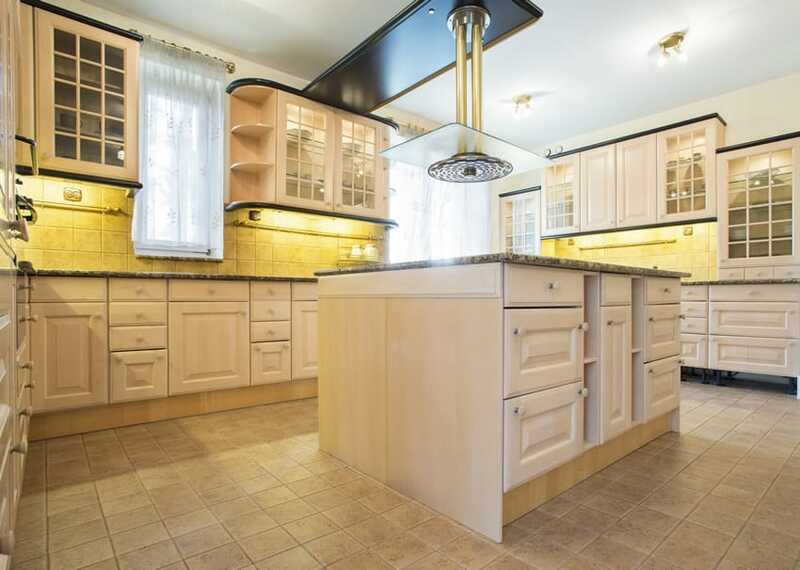 You will notice the repetitive square pattern found in the floor tiles, backsplash tiles and the French cabinet doors of the overhead cabinets. This single line kitchen design with island is setup to provide breakfast bar dining. The all-white finish of the kitchen and the kitchen cabinets highlights the natural beauty of the stone countertop used in this design. The kitchen is mostly made up of the large rectangular kitchen island with a built-in induction cook top. Even the bar stools used for this kitchen are all white, creating a bright-looking kitchen with a little warmth from the color of the stone used. A mid-sized kitchen island which combines both additional bar and dining space with utility. 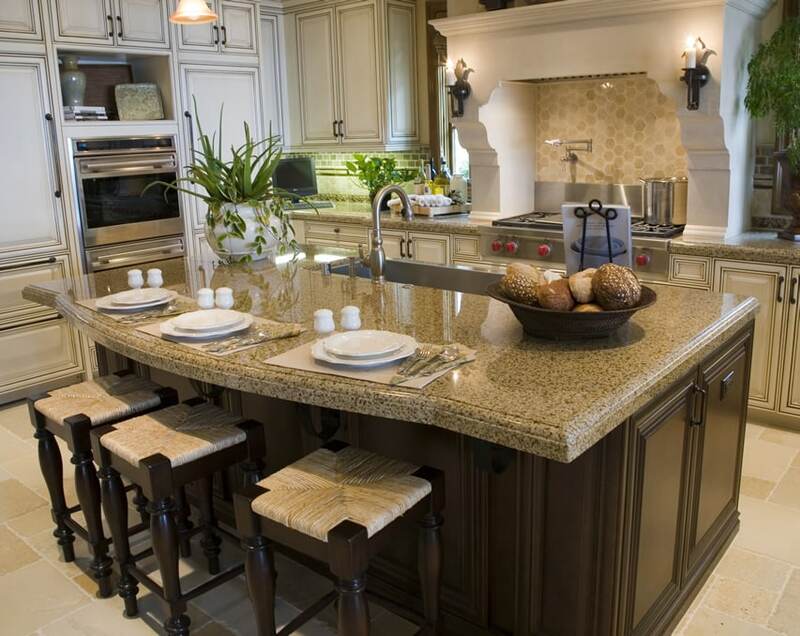 This island counter includes an under mount sink and enough counter space for 3 barstools. There is also sufficient remaining space for additional work counter area. Another classic kitchen design which uses a combination of finishes to achieve this look. The main kitchen cabinets are in a weathered white finish with light cream granite countertop. 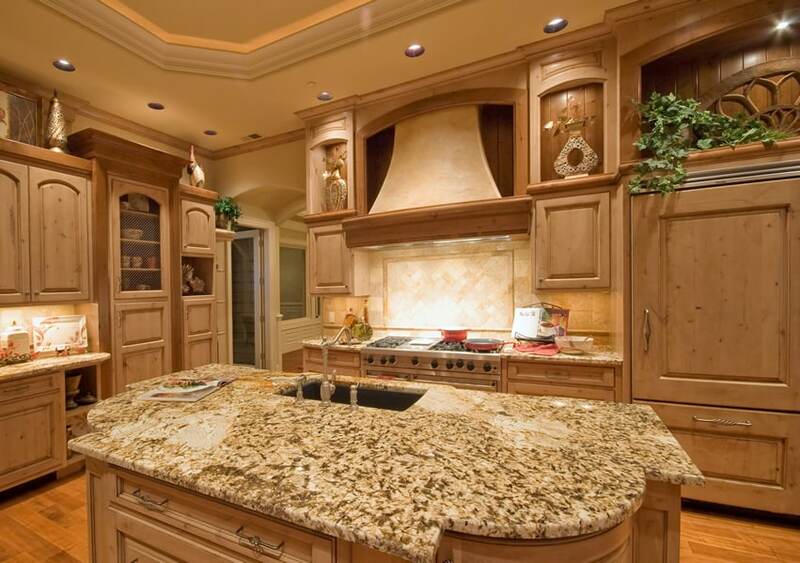 The kitchen island, however, retains its golden walnut finish and uses the same granite countertop. A modern kitchen design which focuses on simplicity and clean lines. It uses a uniform wood laminate finish all throughout the cabinets of the kitchen, creating a sleek and seamless appeal. 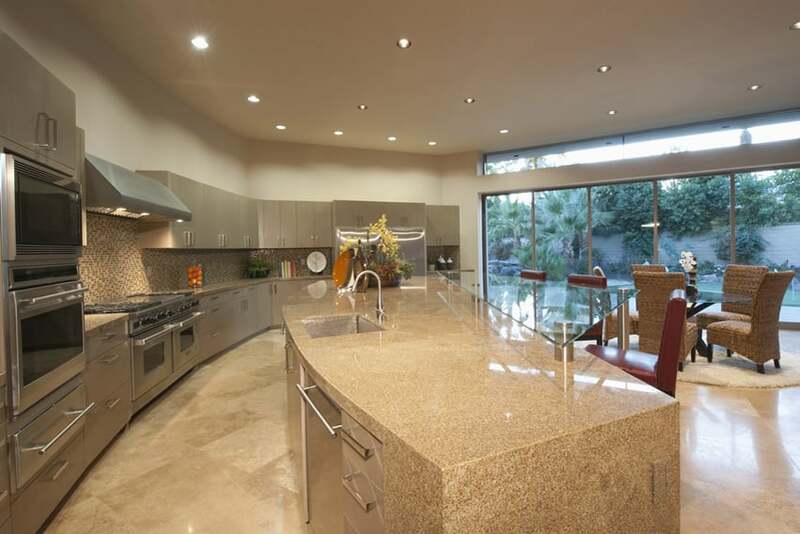 It also has a large kitchen island with a built-in cooking hob and a seamless white solid-surface countertop. The kitchen island also serves as a dining/breakfast area, and is able to accommodate 3 at once. 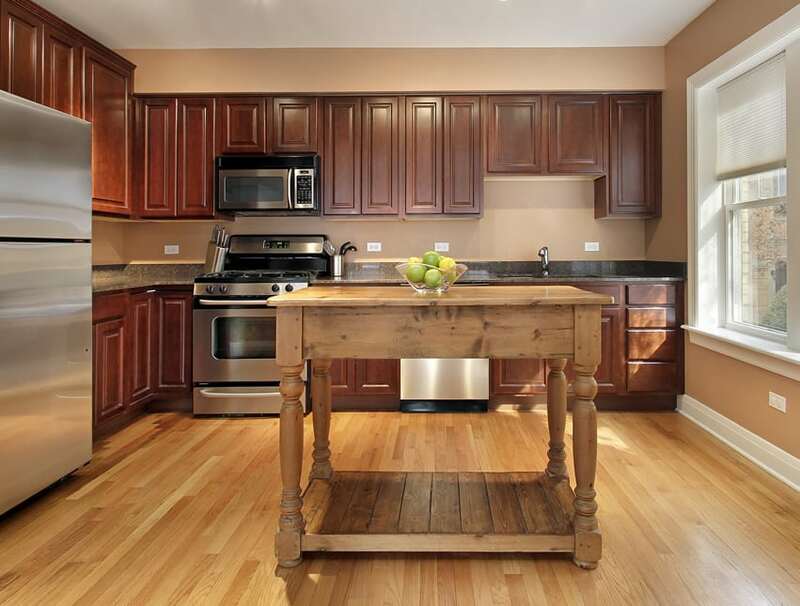 This kitchen goes for a uniform all-wood finish, using wengue-stained solid wood for its cabinetry. 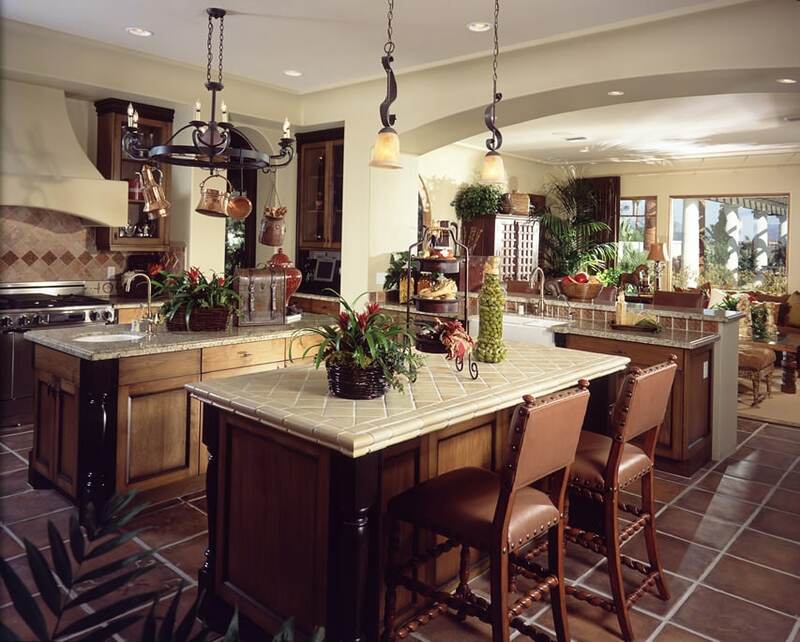 There is an oval-shaped kitchen island in the middle with the same stained cabinets and black granite countertop. 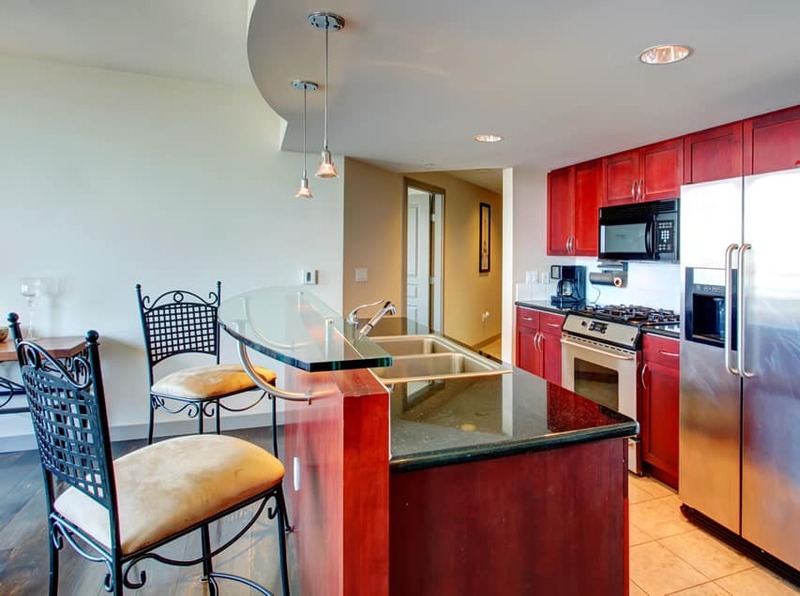 It has a built-in sink and breakfast bar layout with 2 bar stools for dining. The granite countertop overhang allows for eat-in diners to have room underneath for their legs and the long rectangular design gives ample elbow room while eating. 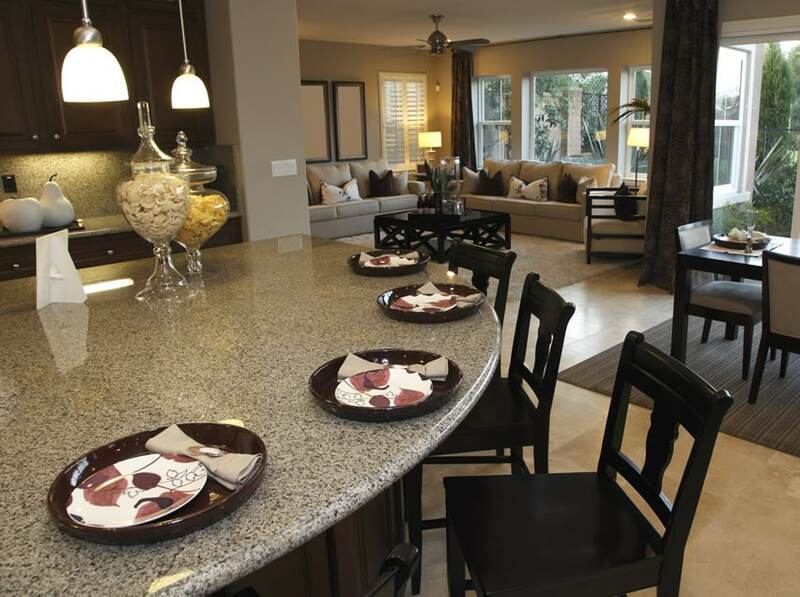 This large kitchen island with seating is large enough to accommodate man diners comfortably. The extra large island counter serves not only as the food preparation area and the dining area but also has additional storage space underneath the counters. 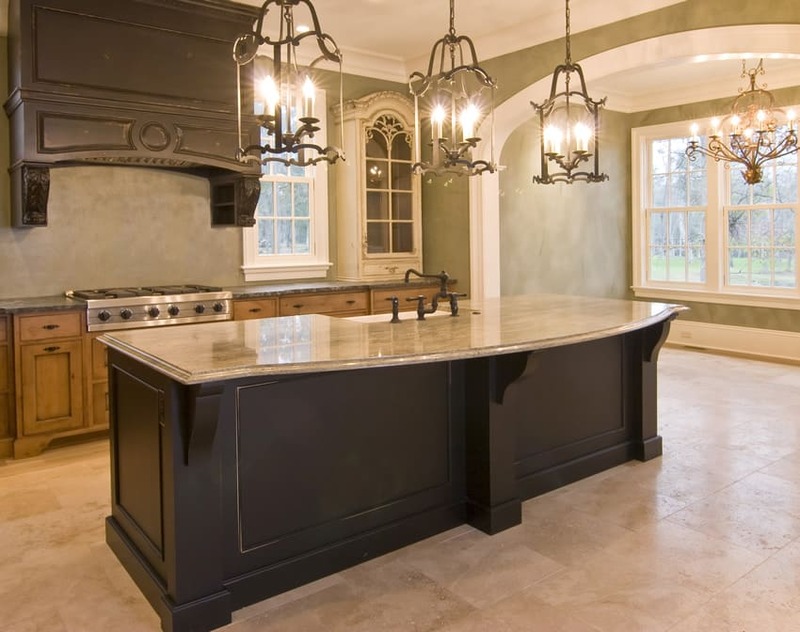 It has light gray classic cabinets, a black granite countertop and faux column baluster supports for the bar counter. This matches the modern matte black pendant lamps and the black-painted rattan bar stools as well. an impressive custom oven hood with tile back splash make a bold statement and act as a focal point. The natural stone countertop in this kitchen island is definitely the show-stopper feature of this kitchen. It integrates an under mount sink and cabinets for storage and is able to accommodate 3 diners. The warm brown tones of the countertop material complements the Mahogany finish of the cabinets and the faux stone cladding on the wall with the kitchen stove. An attractive Wolf 36″ pro-style gas stainless steel range is the perfect complement for the chef of the house. This large kitchen island with seating sets itself apart from the main kitchen cabinets, by using oak-stained cabinets instead of ash white. For its countertop, it uses a thick slab of beige granite with a detailed nosing, and also integrates the kitchen sink. 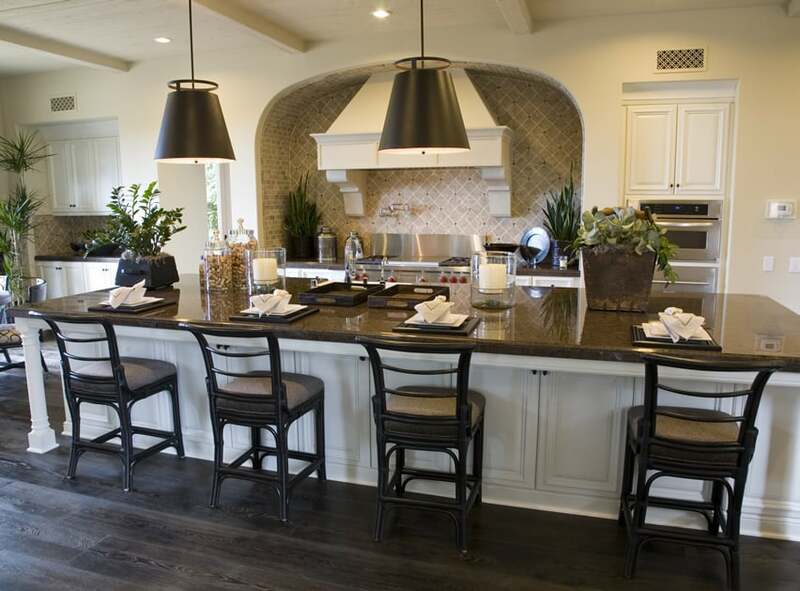 The wood bar stools with woven seats match the dark wood finish of the island. The use of large mirror panels helped enhance the space, making it look more spacious. 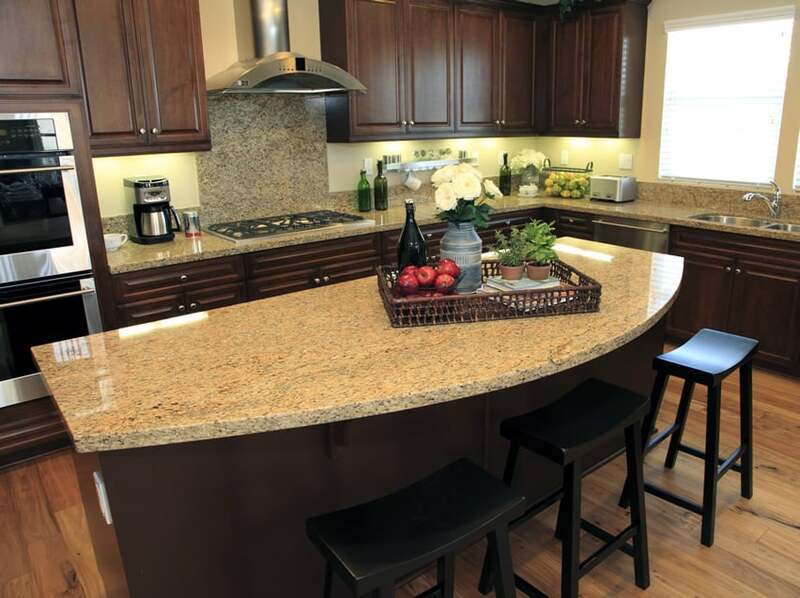 It uses dark mahogany laminated cabinets with black granite countertop. It also has a kitchen island which uses the same finish as the main cabinets and integrates an under mount sink into its surface. The metal bar stools with wire backs are of a classic mid-century design. This modern kitchen space places the range hob on the kitchen island, creating a kitchen that is perfect for entertaining guests and showing off your cooking know-hows to your guests. 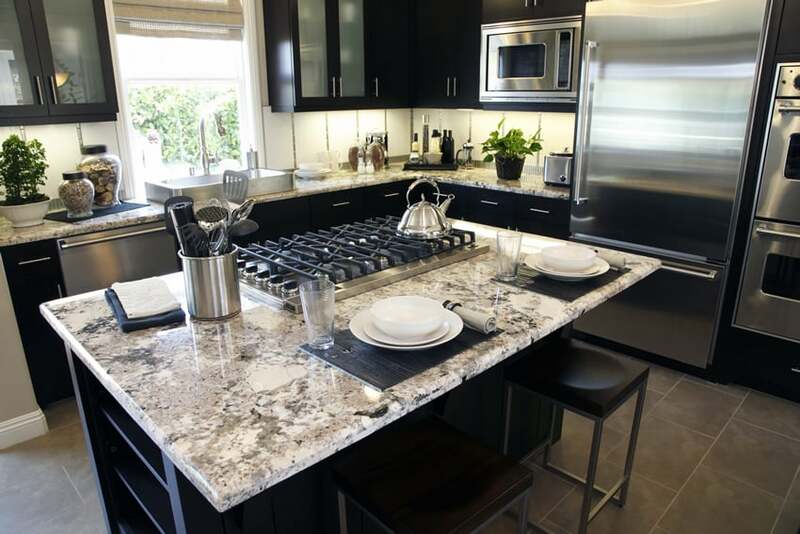 It uses a gorgeous slab of white granite countertop which goes well with the dark wengue laminated cabinets. 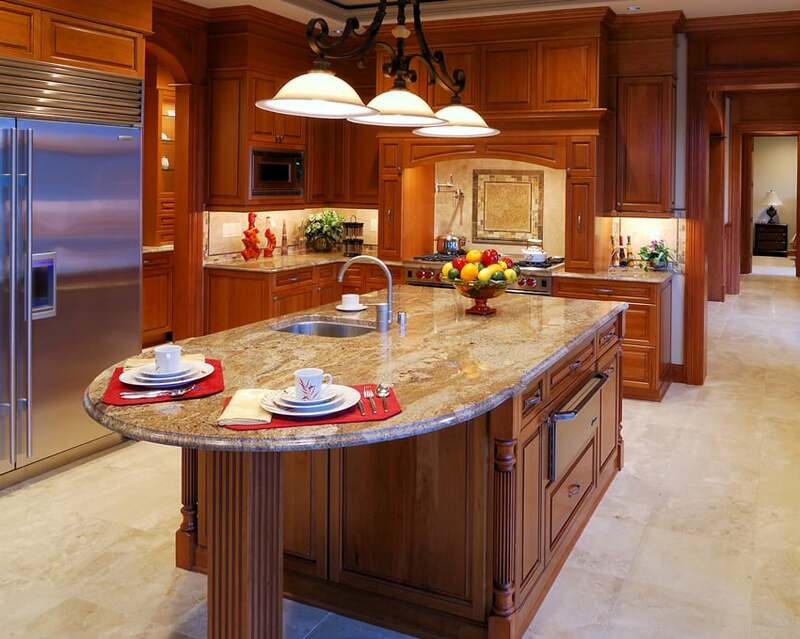 A spacious kitchen with a large rectangular kitchen island in Mahogany wood finish and a thick round-nosed slab of beige granite. A stainless steel under mount sink is integrated into the kitchen island and has enough space to accommodate 2 or 3 diners at once. 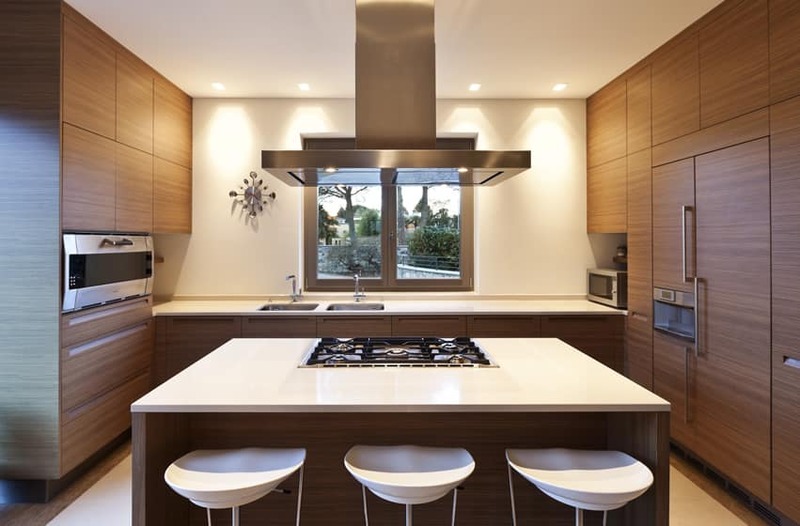 This contemporary kitchen design is mostly of high-gloss modern finishes and materials. 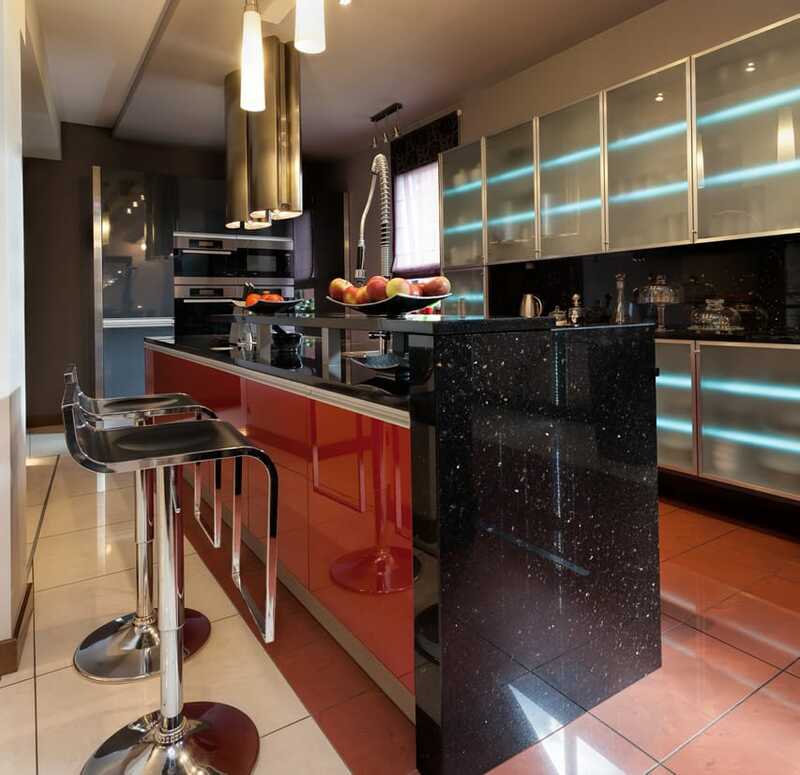 A rectangular kitchen island with high-gloss red laminates stands in the middle of the kitchen. The kitchen island is multi-level, one of standard counter height and a cantilevered slab of black galaxy granite serves as the bar counter height surface. A white-themed kitchen which has gorgeous black-painted wood plank floors to help emphasize the white cabinets and a gorgeous slab of white granite countertop. 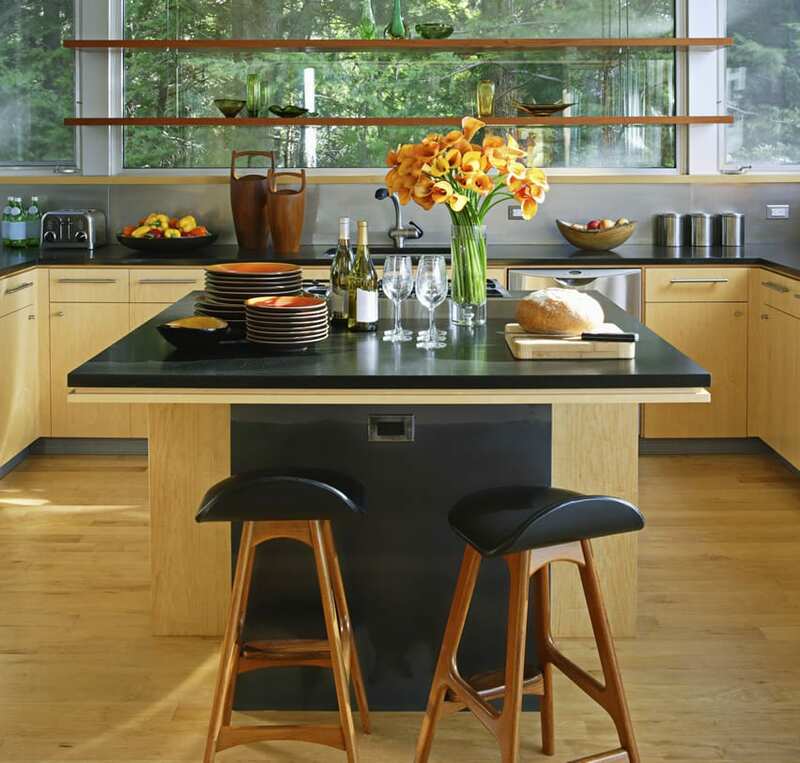 The kitchen island is in a semi-circular shape and has a pair of dark saddle bar stools to match. This kitchen island maximizes the seamless appeal of solid surface by cladding all the stationary surfaces of the kitchen island. It has an additional higher counter for diners, snacking or getting casual drinks made from tempered glass and is mounted on stainless steel supports attached to the main island counter. 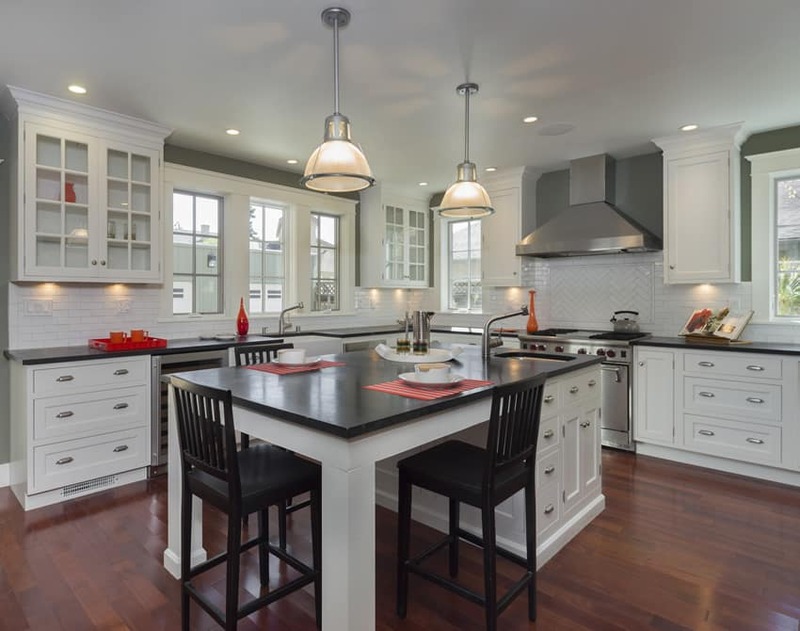 With a generous kitchen space, this kitchen design is able to integrate a large kitchen island right at the center. The kitchen island’s dining/bar surface is supported by small white columns, while the rest of the kitchen cabinets are in Teak, It uses a gorgeous white quartz countertop to tone down the warm red of the teak. 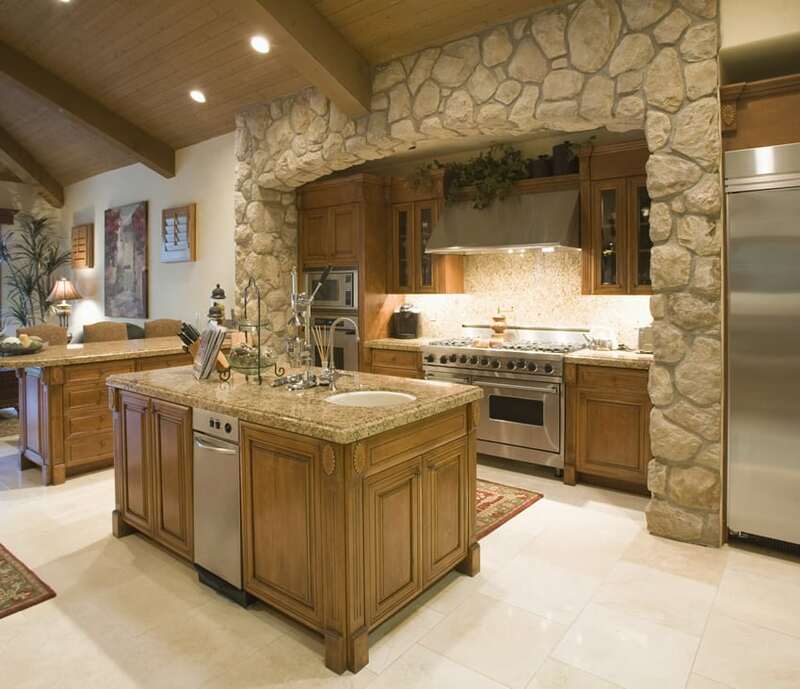 A large portion of this kitchen space is occupied by the massive quarter-circle kitchen island counter. The frame is made of dark Millettia Laurentii wood cabinets and has a thick slab of salt and pepper granite counter with round nosing. This kitchen island is mostly for additional dining space and food preparation area. This large kitchen space follows a more classic kitchen cabinet design, which combines white kitchen cabinets for its main counters and powder blue cabinets for its island counter. The kitchen island is quite large, placed in the middle and has a square shape. It has a built-in wash area and can sit 2 to 4 diners at once. Even when used as bar counter, it still has very sufficient space for food preparation and display. Most modern kitchen designers love combining design aesthetic and utility, and this design is one good example for that. With quite a limited space, the main kitchen cabinets are all dedicated for the built-in ovens and refrigerator and pantry storage space, occupying the full wall. To make-up for this, it has a large rectangular kitchen island which has the essential cooktop and sink area. 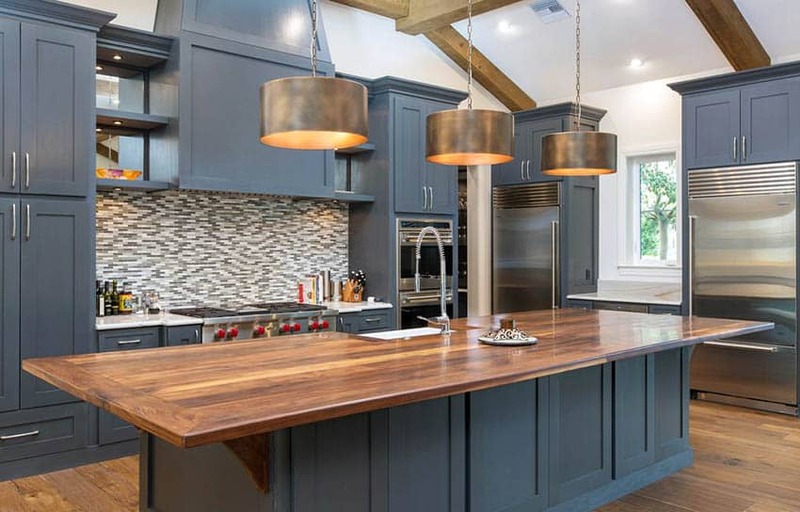 The countertop material used is dark gray solid-surface and includes a wooden butcher’s block on top of the solid-surface for the kitchen bar counter. 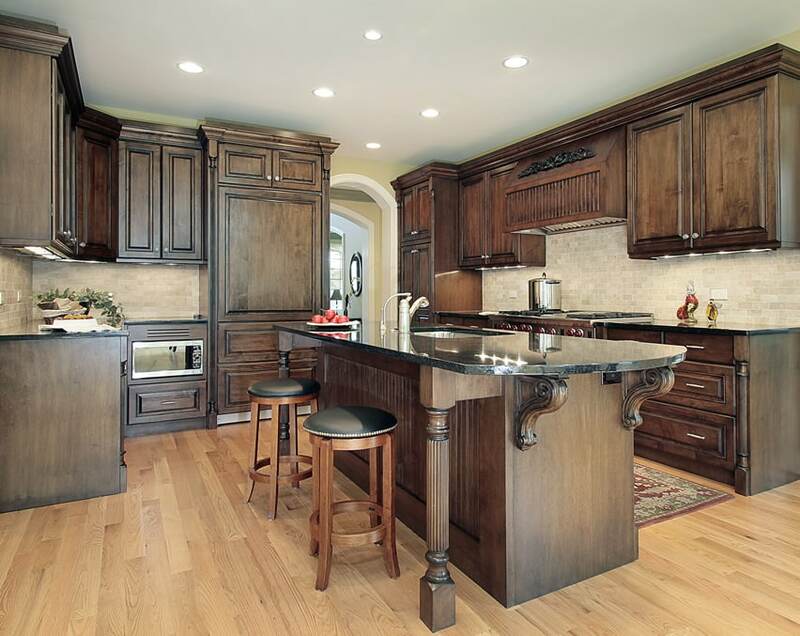 Following a traditional kitchen design aesthetic, this kitchen uses classic cabinet designs with a traditional finish. 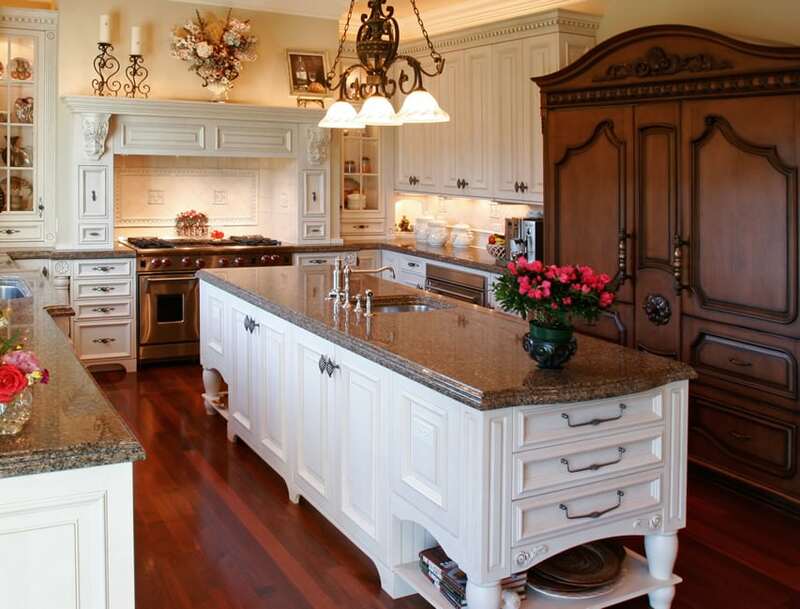 Antiqued walnut cabinets are topped with beige granite countertops. It also has a large kitchen counter in the shape of a simple wall molding and integrated the under-mount ceramic sink and can sit four to five diners at once. An l-shaped layout can get the kitchen island ideas flowing by creating the need for a custom shape to better accommodate guests, such as in this rounded island design. This kitchen design combines modern and traditional aesthetics. While its cabinets are traditional-inspired, they are laminated doors in red Mahogany and topped with beige granite with flat nosing. A long kitchen island is parallel to the long side of the kitchen counter and also uses the same materials as the main cabinets. This kitchen island serves mostly for additional workspace, storage and dining as there are no cook range or sink integrated. Clean and crisp, this black and white themed kitchen is a timeless beauty. It has traditional-style paneled cabinet doors in white and topped with a thick slab of black granite. The kitchen island stands in the middle, rectangular in size and quite massive. It has an under-counter ceramic sink and has three white bar stools for diners and spectators. With a regal and elegant appeal, this spacious kitchen space will surely be the object of envy for many. It features vintage forms and finishes from its interior finishes up to the furniture and cabinetry themselves. The main kitchen cabinets are in a light yellow antiqued paint finish, while its massive kitchen island has mahogany-stained cabinets with granite countertop in an elegant shape reminiscent of molding profiles. A small kitchen doesn’t always have to be devoid of a kitchen island. This particular example shows how kitchen islands help visually divide or segregate the kitchen in an open style layout. Cabinets are built from simple ribbon-grain plywood with red mahogany stain and simple black granite. The kitchen islands also includes a higher bar-counter height surface from tempered glass which can accommodate two people. This is another example of a small kitchen space which is able to integrate a kitchen island into its design. To keep the design unified, the palette keeps itself consistent all-over. adapting one wood tone all throughout the space. It uses yellow-toned pine laminates for all cabinets and blue azure countertop. The kitchen island is large and rectangular with no sink or range hob built-in. It also has 3 bar stools in the same finish as the cabinets. Boasting a large window with a great view of the city, this kitchen island is at the perfect spot. This kitchen island is at the standard counter height and integrates an under mount sink and is quite noticeably long, enough to accommodate 4 or even 5 diners. 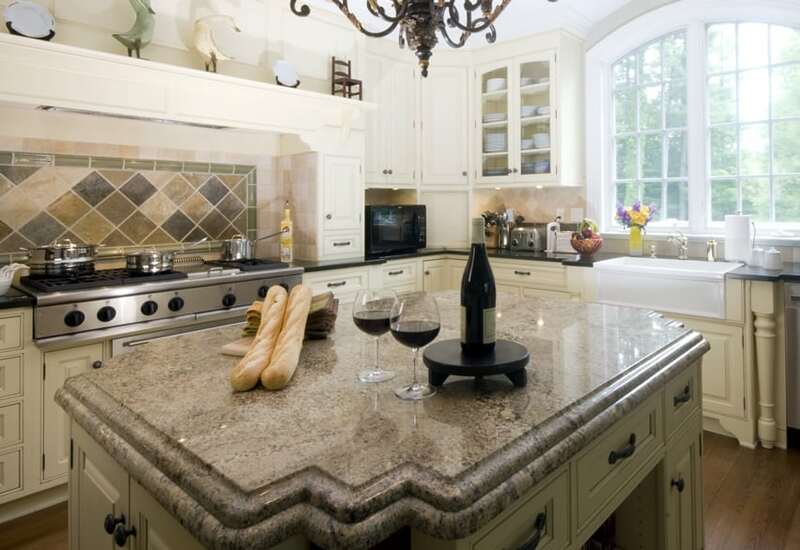 The counter is made from built-up gypsum and topped with a light cream colored granite. 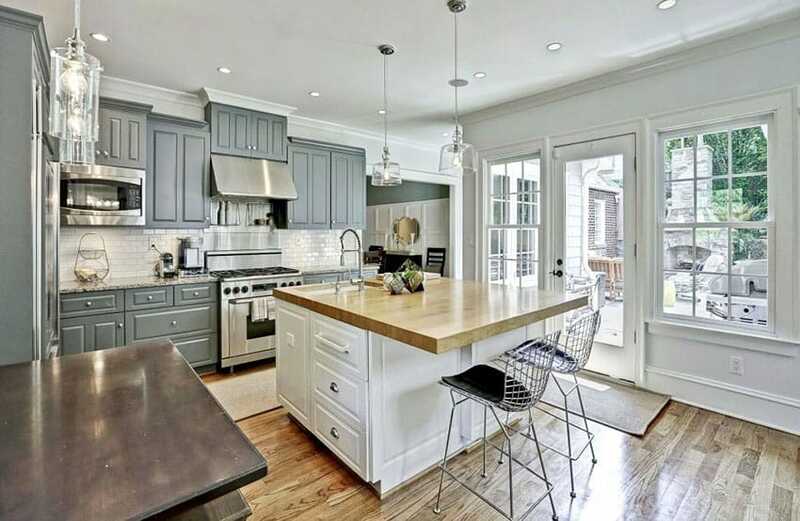 With an all-gray color scheme, this kitchen boasts of elegance and masculinity. It has a large kitchen island with cabinets laminated in a light gray color and has a countertop with a dark gray laminate, with added texture to give variation to the surfaces. 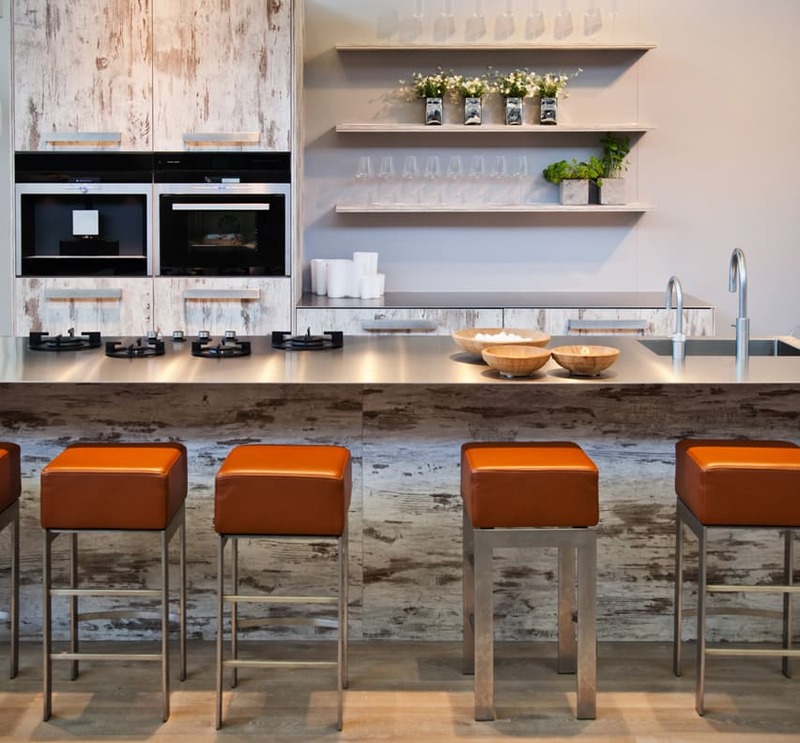 To match the theme of the kitchen, it has modern cube stools with black leather seats and brushed stainless steel legs. This traditional kitchen design adds a modern twist to its classic design cabinets by combining the teak wood finished cabinets with dark-gray painted cabinets. The large U-shaped kitchen island has vertical wooden sidings in a gray paint finish and a thick red-orange granite countertop. The gap in the U-shaped island is meant for a large cooking range. This small kitchen is able to fit in a narrow kitchen island to provide additional preparation space. 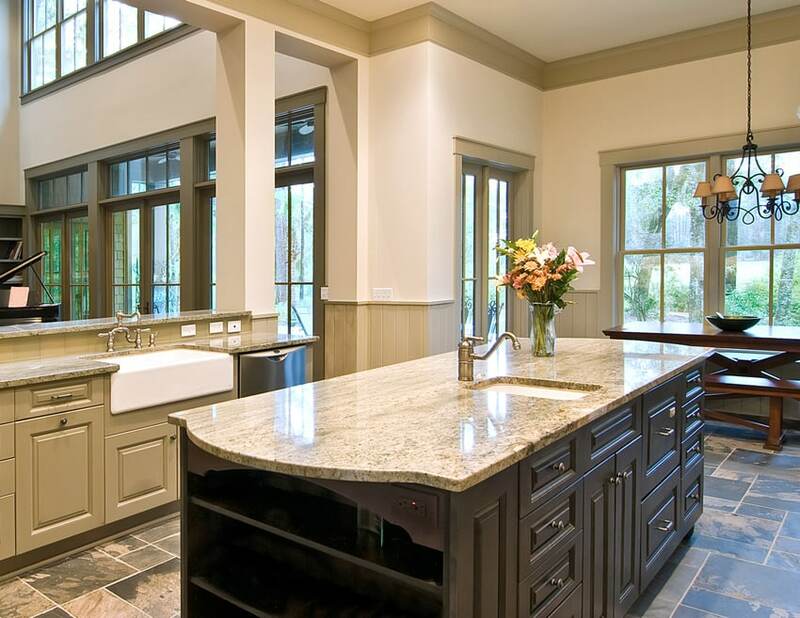 It has paneled cabinet doors in dark wengue finish and topped with a cream-colored granite countertop. 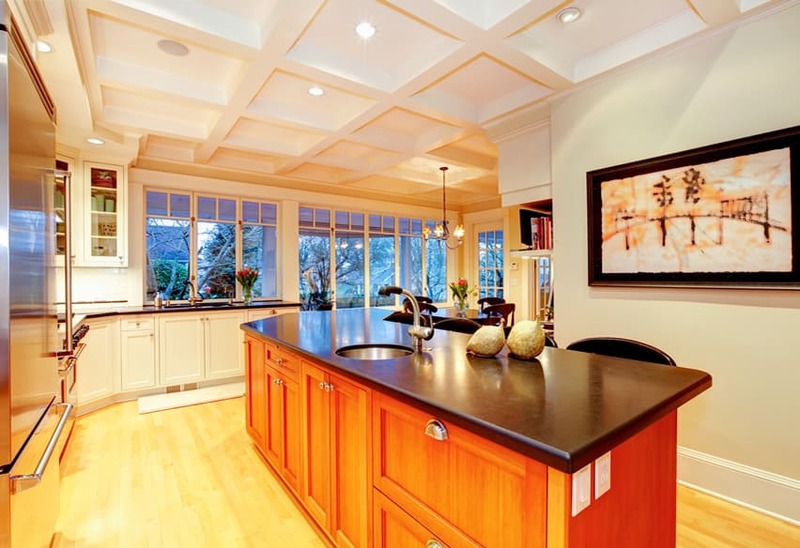 With an open-type plan and high ceiling, this kitchen feels and looks spacious. The kitchen cabinet finishes have two different colors, the main cabinets having a light beige color and the kitchen island in a dark brown color. The kitchen island uses a thick slab of Seinna Beige Marble for its countertop, and has a lot of storage space and shelves for display. 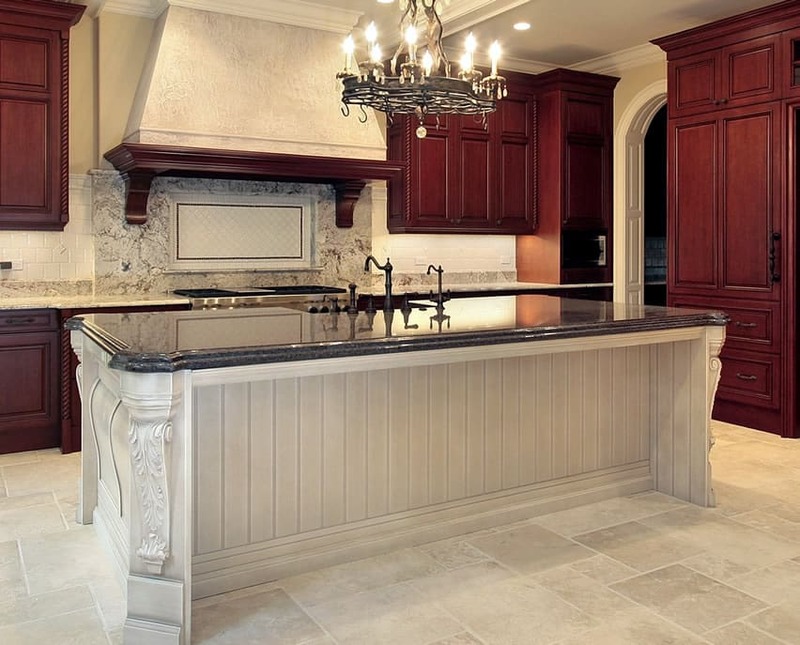 A neoclassic-inspired kitchen with a large rectangular kitchen island. 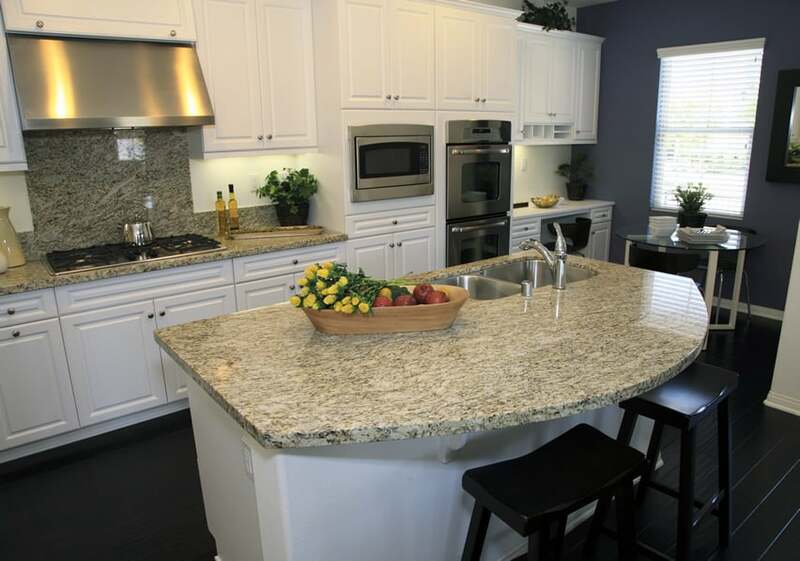 Its base has an ashy white finish and topped with blue azure granite countertop. It also integrates a kitchen sink with a complementing oil-rubbed fixtures. 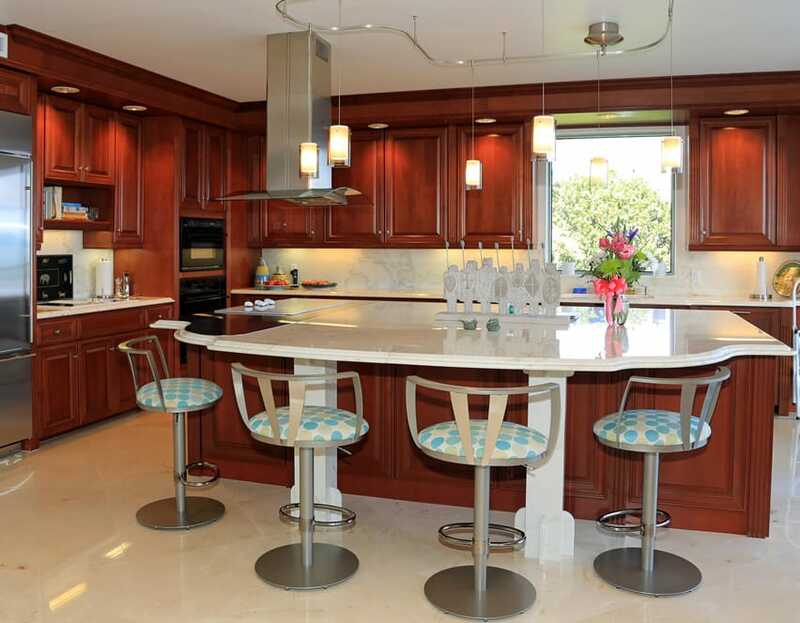 The cabinets are in cherry wood and contrast well against the white cabinet of the island. 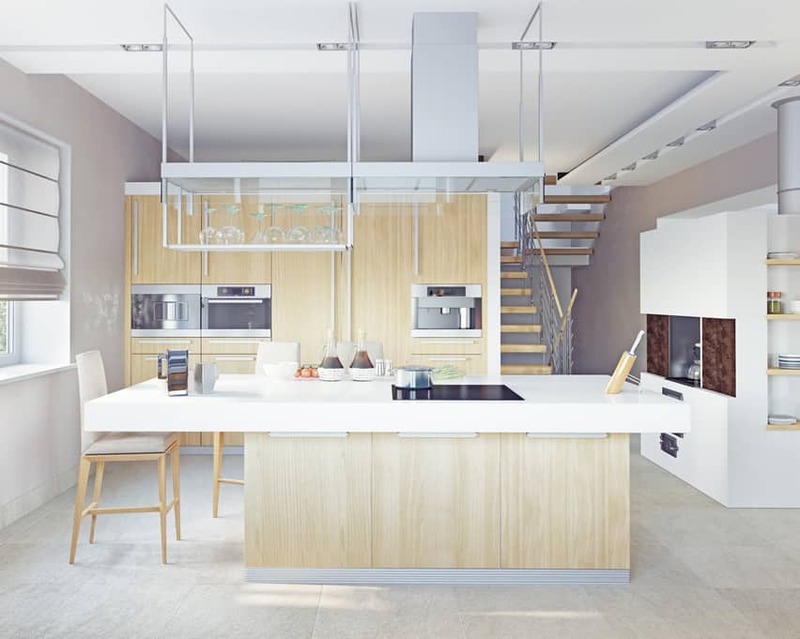 This modern kitchen has an Asian zen-like simplicity and elegance. It has very simple kitchen cabinets in pine laminate finish with no moldings and topped with solid black granite countertop. In the middle of the kitchen rests the square kitchen island with the same finishes as the main cabinets, and a built-in cooking hob. The design allows the user additional space for food preparation, as well as dining. 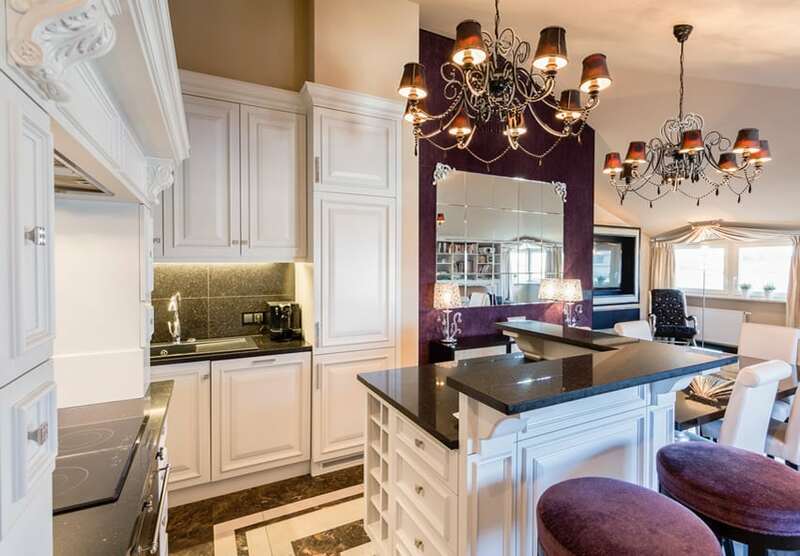 With a European glam design style, this kitchen will surely leave a fabulous impression. It has simple white paneled kitchen cabinets and black granite countertops. The L-shape kitchen has a kitchen island in the center, square in shape, and has an upper bar counter height surface. A modern kitchen design with a slightly industrial-style aesthetic with exposed pipes and ducting. It uses plain light cream laminated cabinets all throughout the kitchen. 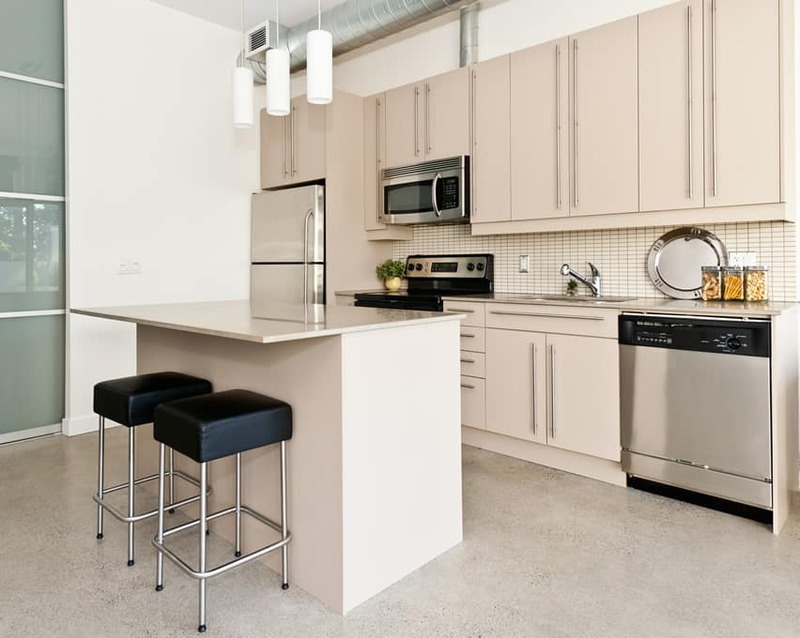 There’s a small bar height kitchen island in the middle with the same light cream laminates and a light cream solid surface countertop which is almost the same color as the laminates. 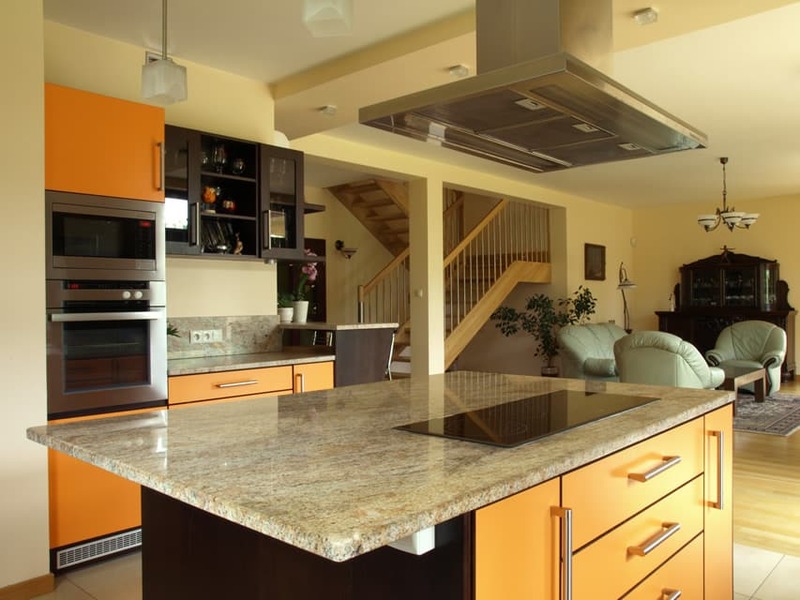 This modern kitchen uniquely combines dark wengue wood laminates with a bright orange laminate for its cabinets, creating a fun and refreshing palette for the kitchen area. It has a square kitchen island with a built-in induction cooker and a nice large surface for food preparation and for dining. The countertop material is granite placed on a plywood substrate. An example of a kitchen design for a small space. This design includes a kitchen island which mostly functions as additional preparation area and as a dining area. The framing is laminated with a wengue color, while the countertop is white solid surface. 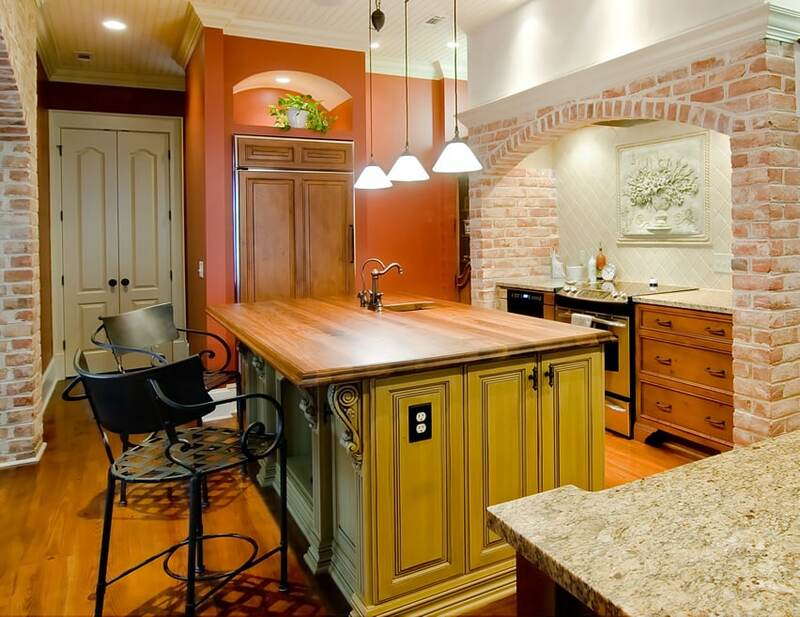 A great example of a narrow kitchen island that is sizable enough to fit an island counter. Unlike the white-painted cabinets on the main counters, the kitchen island separates itself from the rest of the kitchen with its teak wood cabinets and black granite countertop. As this kitchen is quite narrow and long, a long multi level kitchen island was used. One surface is at standard dining table height, serving as additional dining area, while the other is at standard kitchen counter height. 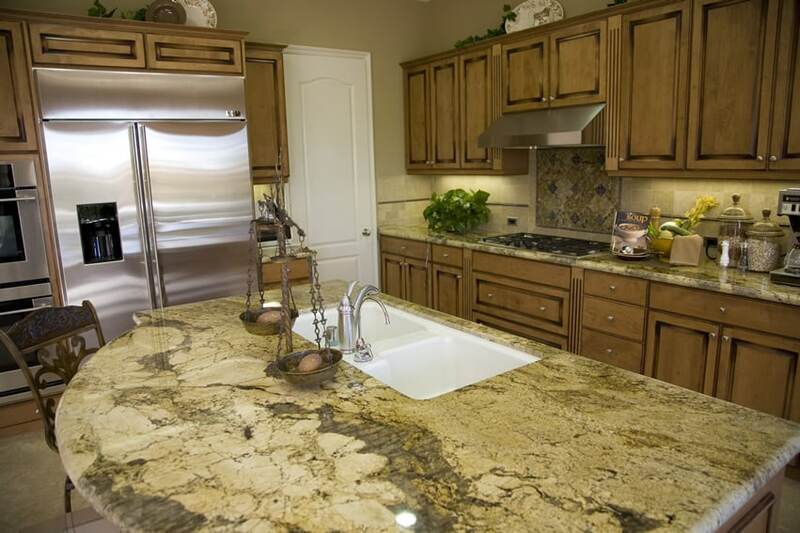 Both surfaces uses sienna beige granite countertop. 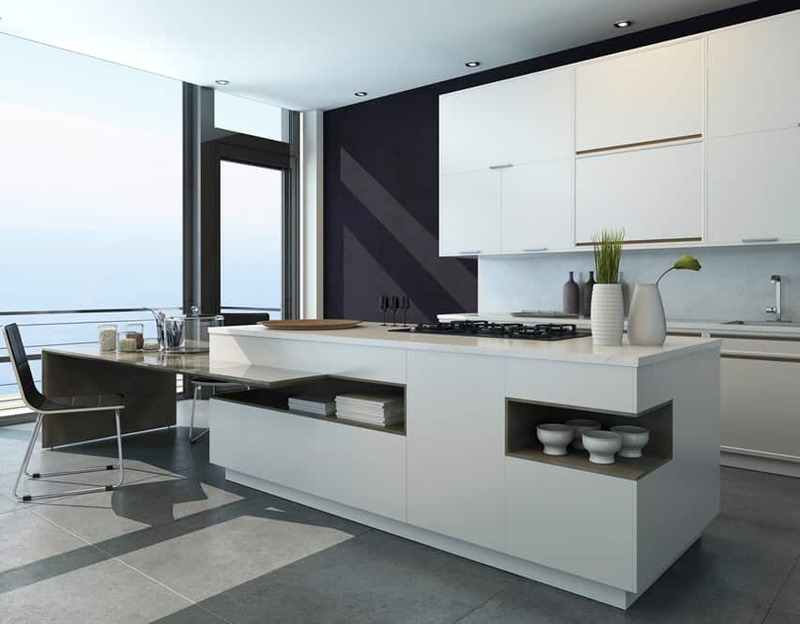 Another modern kitchen design which combines an ash-tone wood finish laminate with plain white laminates. This results to a warm and light color combination which is very visually-appealing. A rectangular bar-height counter stands parallel to the main kitchen counter and is made of light beige solid-surface material clad on a plywood framing. The combination of molding details and solid wood finishes add to the elegant appeal of this kitchen. A narrow rectangular kitchen island stands in the middle, with white-painted cabinets and dark red granite countertop. It has a built-in under mount sink and satin-finish faucet that perfectly matches the aesthetic of the whole kitchen. Following the unique shape and layout of the kitchen, this wrap-around extra large kitchen island adapts the shape of the wall in which the main kitchen cabinets are against, forming half of a hexagon. The cabinets are solid wood in an off-white finish, while the countertop material is white as well. The large kitchen island also has a built-in ceramic sink at the center and a range cooktop on the right end of the counter. For this contemporary kitchen design, its large square-shaped kitchen island counter is its most stand-out feature. 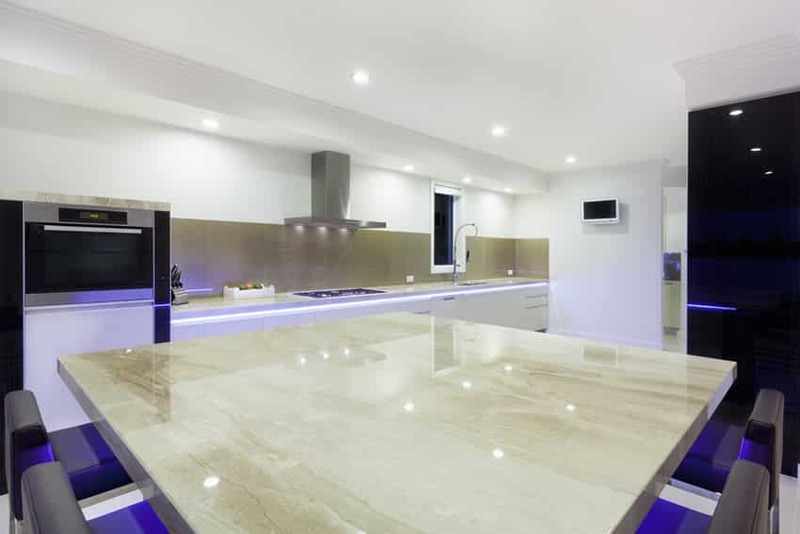 Its countertop material is a gorgeous slab of golden spider beige stone and integrates a bluish purple lights underneath the counters to create a dramatic effect. This kitchen island serves mostly as additional dining space as it is a little far from the main kitchen counters. This ultra modern home definitely maximizes its open layout by utilizing its kitchen island to hold the induction cooker and the under mount sink. The black granite countertop perfectly camouflages the induction cook top, making smooth and seamless, and perfect with the white-laminated drawers and cabinets. 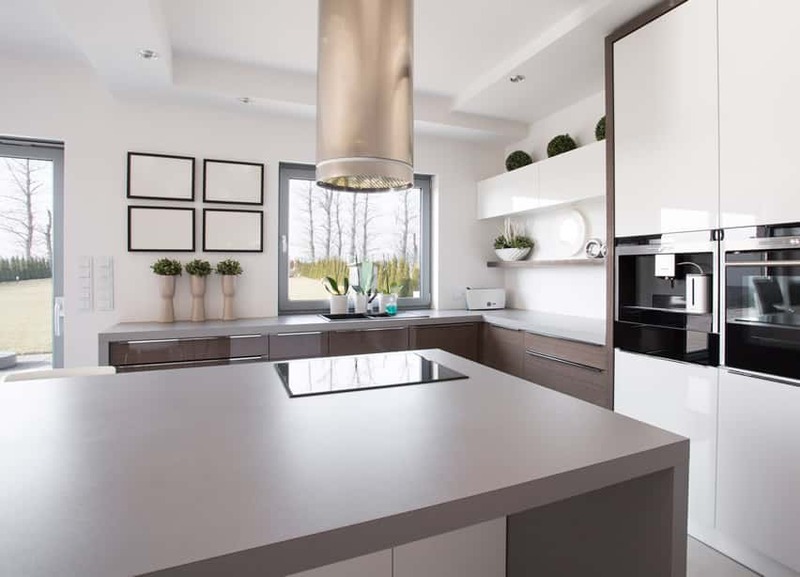 This is also a modern kitchen design, but unlike the previous examples, this particular design goes for the more glossy and reflective finishes rather than a combination of matte and reflective surfaces. The floors are white quartz with white walls and white piano-finish cabinetry, making the whole kitchen look very bright. The polished black counter top on the kitchen island balances the bright surfaces, while the stainless steel trim between the counter and the cabinet transitions the cabinet and counter top material smoothly. A modern kitchen design which effectively capitalizes on the natural beauty of its finishes. 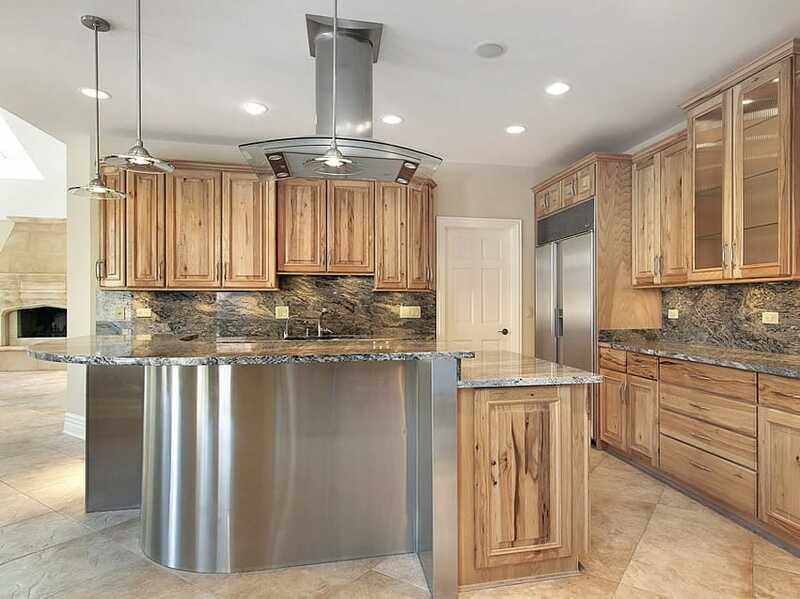 Gorgeous walnut cabinets are kept unstained with a light layer of clear finish. 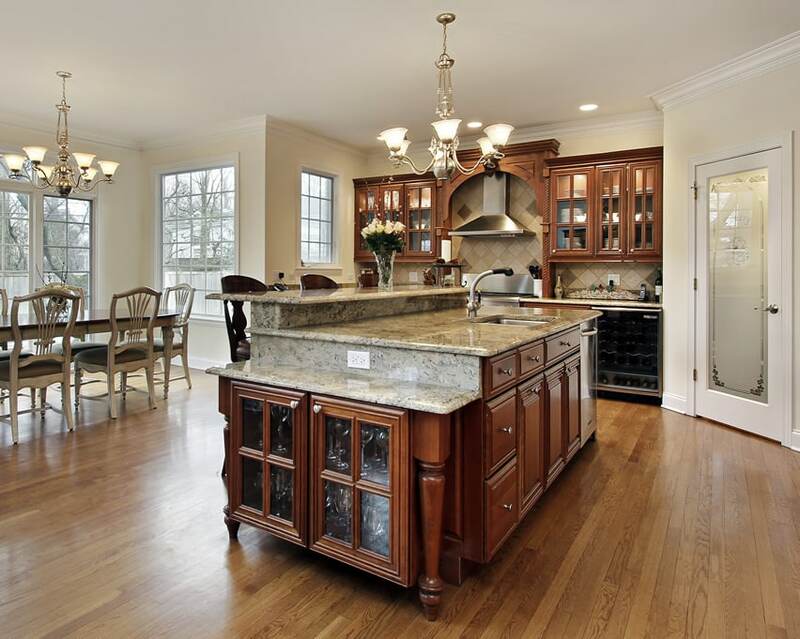 This kitchen also has a very large kitchen island with two levels of counter heights. One is at normal counter height with black travertine countertop and the same walnut cabinets, while the other one is at bar counter height with the same black travertine but with rounded corners and stainless steel body. A spacious modern kitchen which goes for a bold red for its kitchen cabinets. 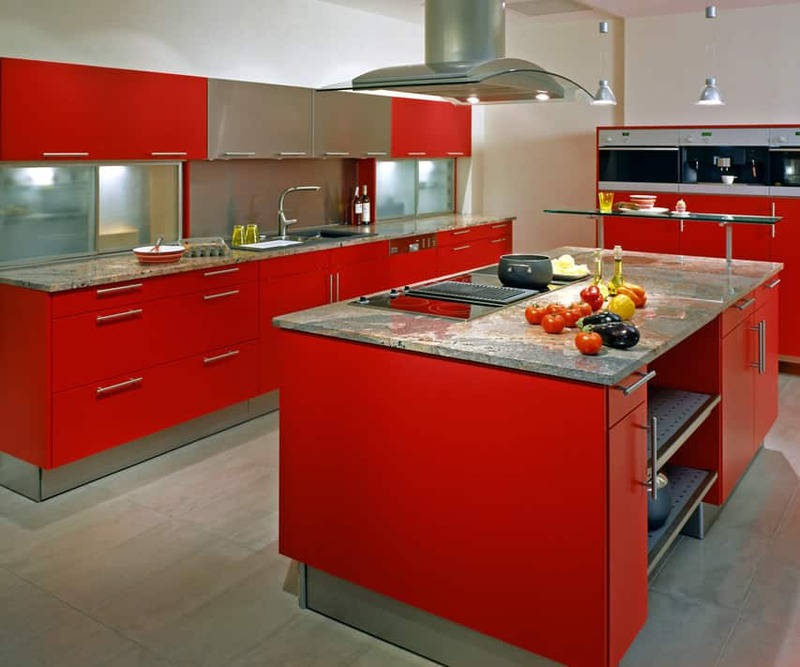 All cabinetry is in red laminate finish combined with stainless steel and glass. The kitchen island is rectangular with a built-in induction cooktop and an overhead stainless steel range hood. 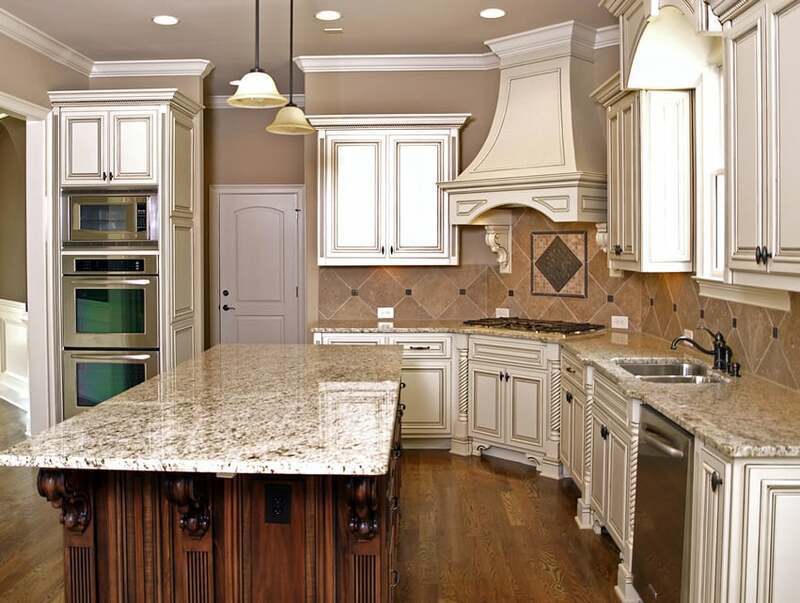 While the kitchen cabinets are very modern, the countertop material choice is a more traditional, opting of a gray-brown granite countertop instead of solid surface. 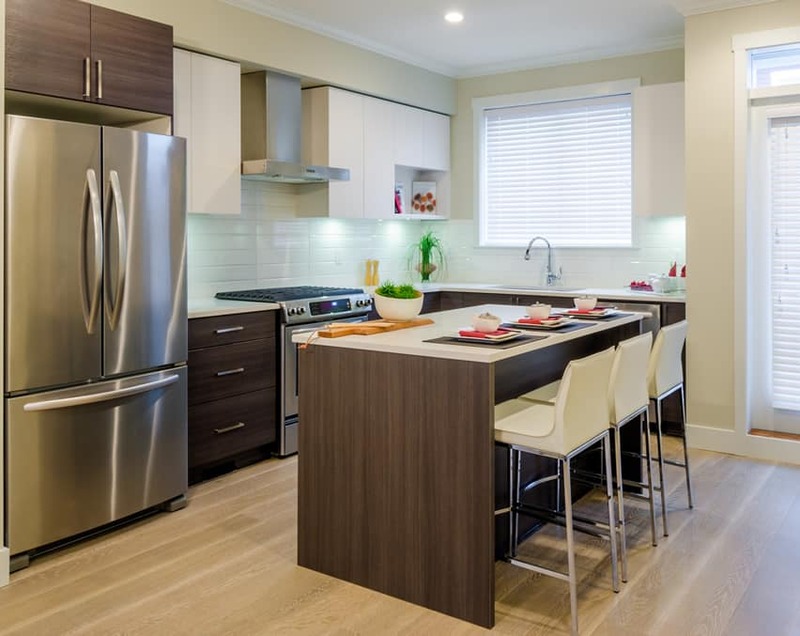 This modern kitchen design is sleek and elegant, perfect for small spaces and open layout floor plans. Kitchen cabinets have a plain white finish with stainless steel handles. 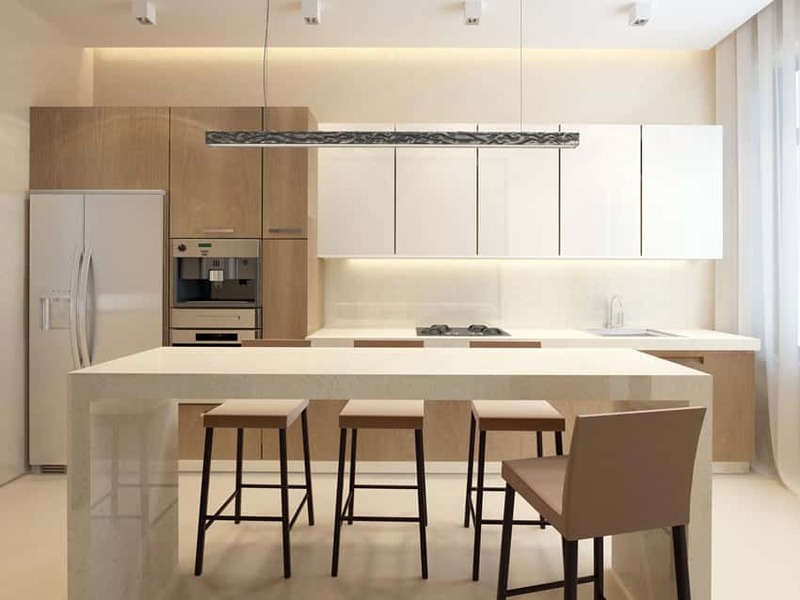 It has a rectangular kitchen island with white solid surface countertop and directly connected to the dining table which is made of beige solid surface attached to the kitchen island. This kitchen island is modern and sleek, with its high-gloss slate gray cabinets which counters the rough finish of the brick accent wall. 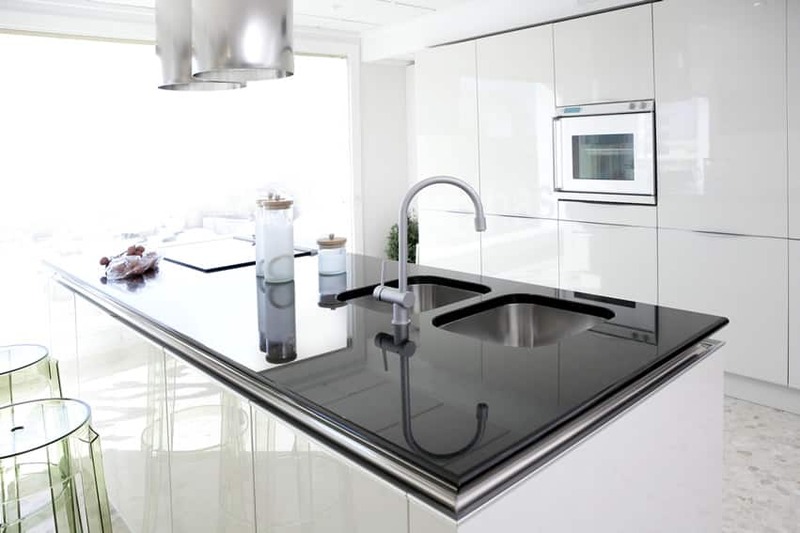 Its countertop material is black solid-surface, creating a glossy and seamless finish. 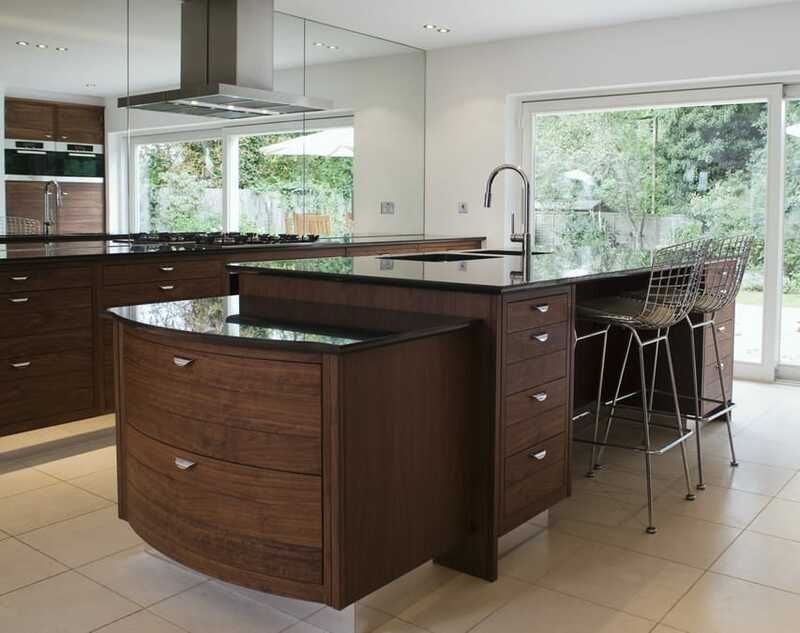 A gorgeous modern kitchen which combines warm walnut laminate finish with plain white laminates for its cabinets. The L-shape kitchen has a large rectangular kitchen island in which the induction cooker is built-in. Instead of conventional stone or solid-surface materials, this island opts for the more modern option – a beige-colored laminate finish. This is another excellent example of a modern kitchen design. It uses pine finish laminates for its cabinet doors and uses aluminum door handles to keep it sleek and modern. A large rectangular kitchen island stands in the middle with the same pine laminates as the main cabinets and topped with white solid-surface with an 8” wide fascia. 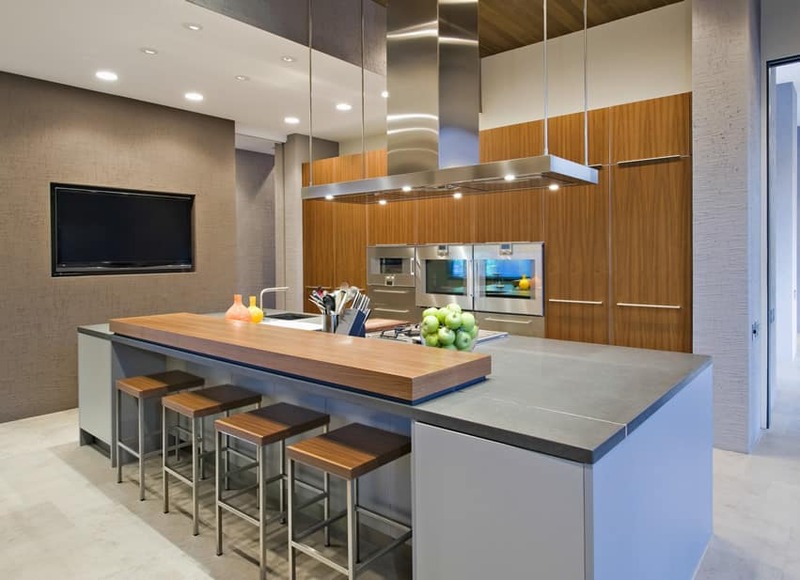 Unlike the previous modern kitchen design examples, this sample uses a unique type of laminates for its kitchen cabinets and kitchen island. Instead of typical wood finish laminates, it uses laminate panels with a weathered wood design, creating a modern but rustic look. The kitchen island uses rose gold-tinted stainless steel countertop instead of stone surfaces, adding a sleek finish to the rustic-looking cabinets. A rustic kitchen island with distressed wood is a great way to bring a touch of country charm in to your otherwise contemporary design. This kitchen utilizes a white marble countertop for the wood island contrasted by a gray quartz counter for the main counter area. 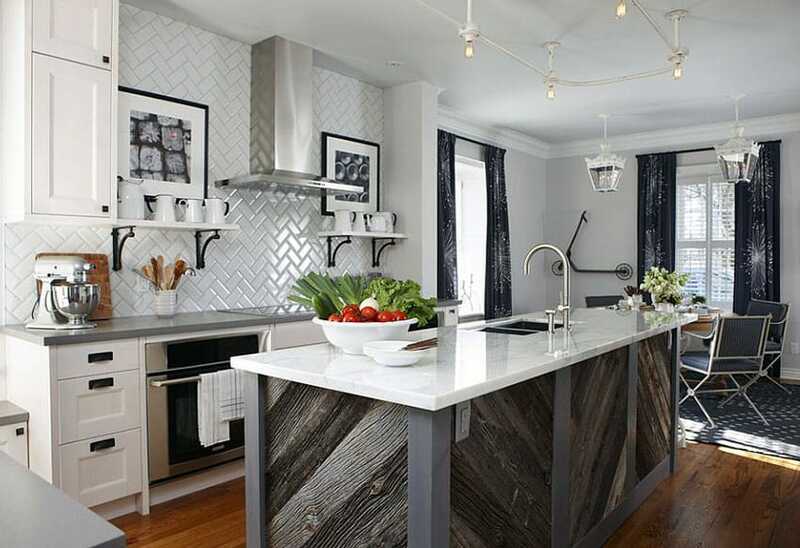 A white tile backsplash with a chevron design pattern compliments the white cabinetry and open shleving. This traditional kitchen has an interesting portable rustic kitchen island. Usual kitchen islands have cabinets or base designed similar to the main kitchen cabinets, but this kitchen island is a movable furniture. It’s a standard counter-height table with solid golden oak construction with large turned legs and no cabinets or drawers. 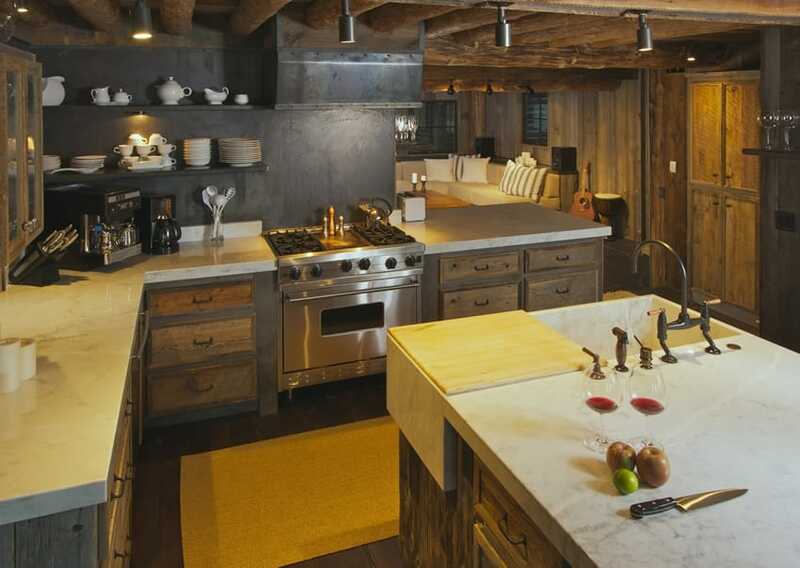 This kitchen has a unique barn-inspired design uses weathered wood in its natural finish. The kitchen also features a movable kitchen island which is in rectangular in shape, which uses the same wood finish as the main kitchen cabinets. The countertop material is a black soapstone with gray ceramic tile siding. A kitchen design which goes for the trendy modern industrial look, combining wood finishes with dark rough surfaces and metal finishes. Its cabinet carcases are painted in a finish which mimics GI sheets, and uses solid Oak drawer faces. It has a rectangular kitchen island with the same finishes as the main kitchen cabinets. For its countertop, it uses solid-surface material which mimics the look marble, and has a built-in sink made from the same solid-surface material. 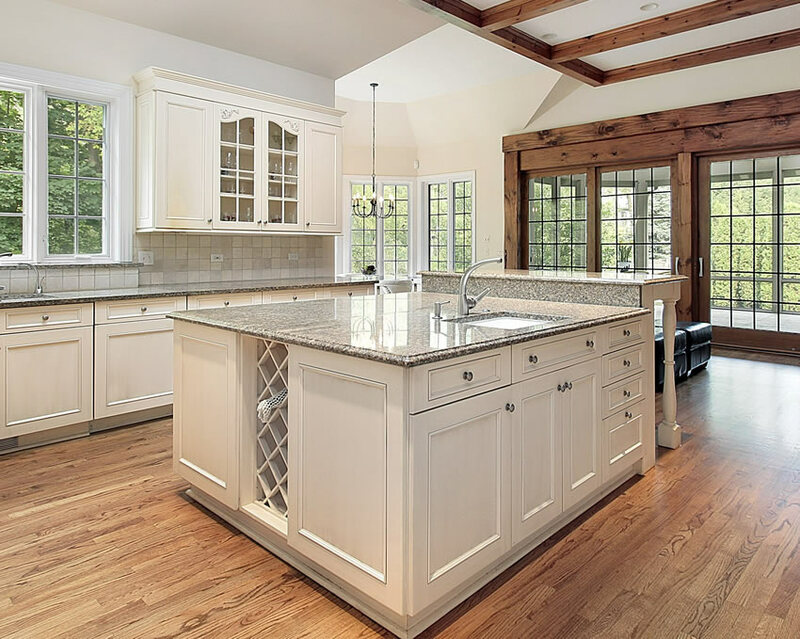 This large traditional-style kitchen has two kitchen islands integrated into the design, allowing more people to work in the kitchen simultaneously. One of the kitchen islands has a built-in under mount ceramic sink and a beige granite countertop. The other kitchen island, however, has tiled countertop instead of a stone slab, and functions as a dining area and preparation area. 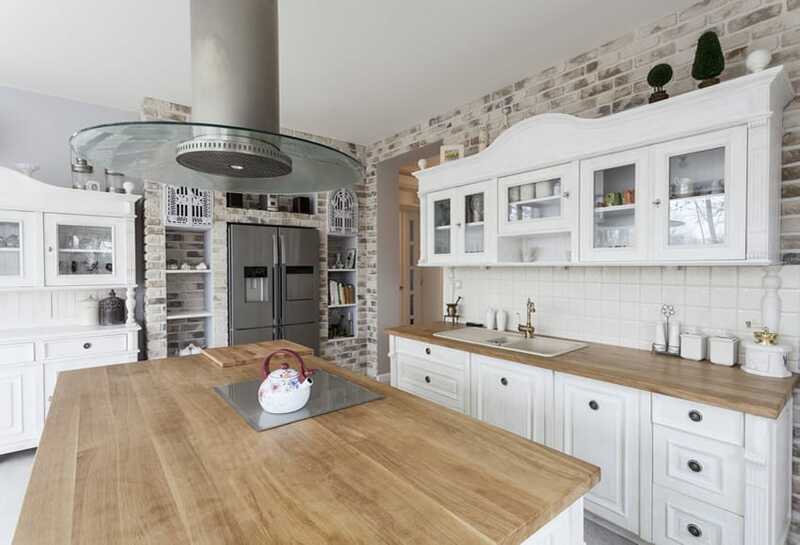 This classic style kitchen has a slightly unusual layout. While most kitchen islands are parallel to the wall cabinets, this one slightly separates itself from the main kitchen cabinets. The gorgeous paneled walnut cabinets of the kitchen island matches well with the gray soapstone countertop. The kitchen island also features a small storage for goblets and wine glass at the side, in addition to a built-in sink and dishwasher. A butcher block kitchen island with an oil finish can be a beautiful addition to your interior design. This kitchen offers a white cabinet island that contrasts against the gray color of the main cabinets. The island serves as a breakfast bar for two as well as an effective meal prep area complete with an under counter sink. Many kitchen island ideas originate from the need to maximize a smaller space. This island helps by being an eat-in breakfast bar, providing under counter storage and offering plenty of extra space for food preparation. Instead of the usual stone countertop materials, a wooden butcher’s block countertop could be an excellent option you can use for you kitchen island, like in this example. The oil-stained wooden surface adds elegance and warmth to the yellow beige kitchen island cabinets, complimenting the wooden finish of the main kitchen cabinets. Kitchen island ideas with light wood counters offer a warm ambiance that homeowners love. This traditional kitchen sets itself apart from the rest with its use of gorgeous solid Oak butcher block countertop for its main counter and its kitchen island. 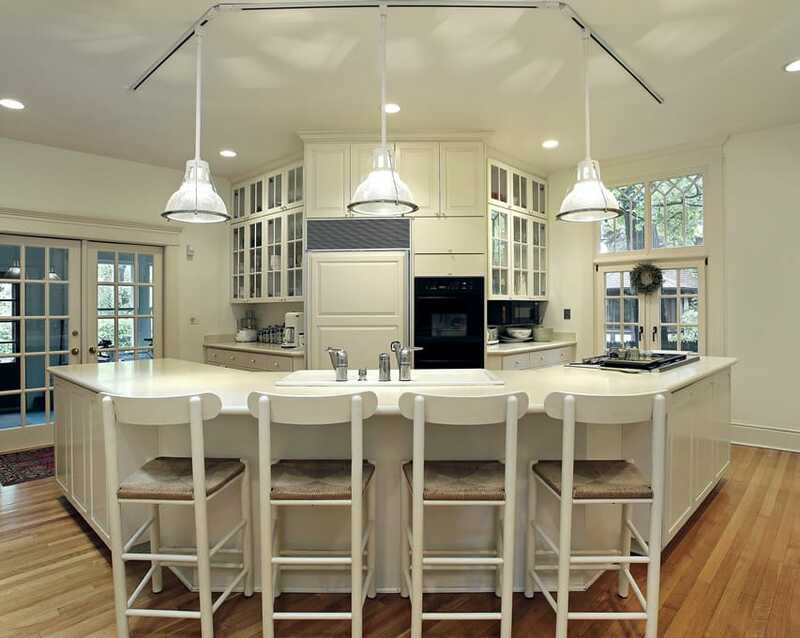 The wood tone helps bring warmth to the white kitchen cabinets while maintaining its traditional chic appeal. 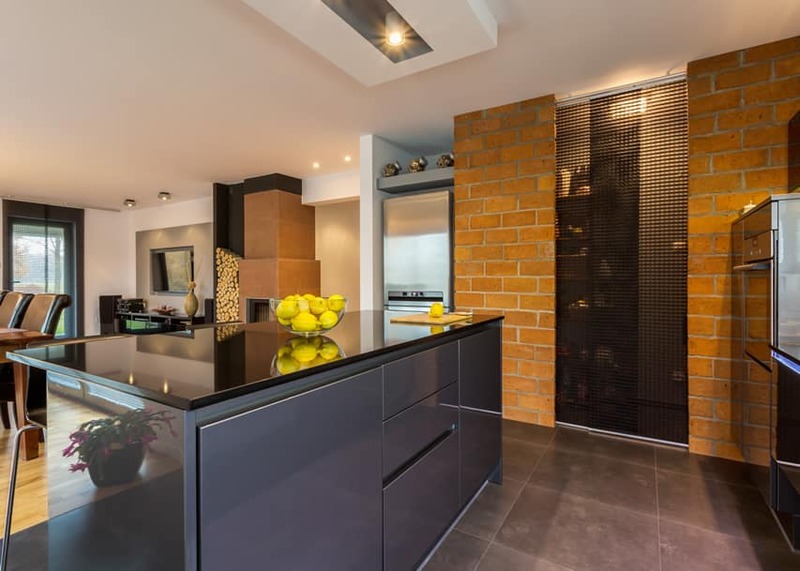 The faux masonry finished walls also complements the countertop material well.